Yesterday was Thanksgiving here in the USA. Having grown up in England and living here since 2001 I never grew up with family traditions but since I’ve been here, married and started a family we are making our own traditions which we hope to carry on for many years. 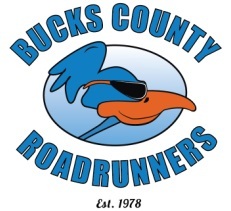 Our day started with the Bucks County Road Runners 24th Annual Thanksgiving 5 Miler. Back in 2010 this was my first ‘real’ race as I had only just started running a couple of months earlier. It was the first race I ran with ‘proper’ running shoes from an actual running store. I was joined in 2011 by my wife and we have run this event every year since. Typically it is only a few days after the Phialdelphia Marathon although last year I felt fresh legged enough to post a 5 mile PR of 40:33. This year with the Marathon being a week earlier and training for the Dopey Challenge in a few weeks I wanted to take it a little easier. Other than the run itself it was a special day for me as my parents had flown in from the UK for the holiday and they were taking part in the 1 mile fun run with our two boys. 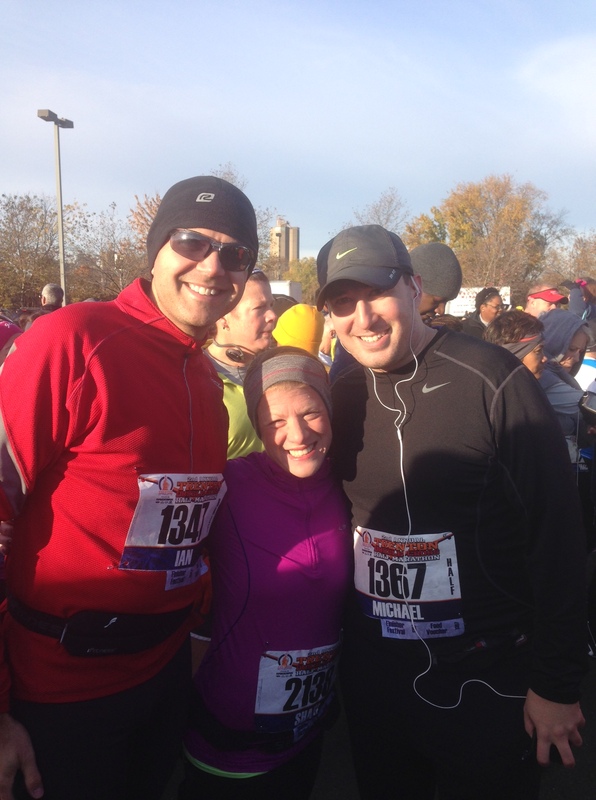 We were also joined by my father-in-law who has run this race many times and my sister-in-law and her fiance. Other than the company, a big difference this year was the temperature. In 2011 I remember running this race in a t-shirt and shorts. Last year I wore a long sleeve t-shirt and running tights. This year was frigid. I was wearing 3 layers on top, cold gear socks, mittens and a beanie and I was barely warm enough. We arrived around 8:30am for the 9:00am start (a nice late start for me) and I left everyone in the car to stay warm while I headed for bib and t-shirt pickup. It was crowded at the sign in tables even though we had pre-registered. I was standing in line for over 10 minutes and by the time I had picked everything up I was shivering so bad my hands were shaking and I couldn’t pin the bib to my sons jacket without hurting myself on the safety pins. I had originally been wearing a pair of thick Brooks running gloves but pulled out the double layered mittens. In addition, the ground was icy underfoot in the parking area (luckily not an issue on the course). With waiting so long to get our bibs and then heading back to meet everyone we didn’t really have much waiting around at the start line (thankfully as we all looked a bit miserable in the cold). My wife and I hurried to the start line and my parents waited back for their start time about 5 minutes later. It was a big crowd and we started near the back of the line so even though the race was chip timed, the timing mat was only in use at the end so our time was a minute off from the gun time as it took us that long to get across the line at the begining of the race. 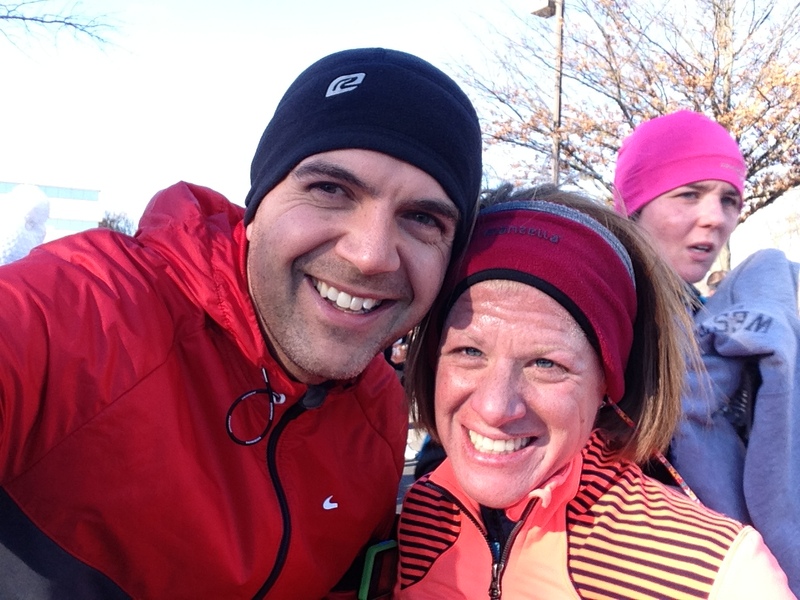 My wife was cold and she wasn’t hanging around…she took off like ‘Little Red Rocket Hood’ from the start and held a good pace as we weaved our way around the runners at the start to where the race began to open up. 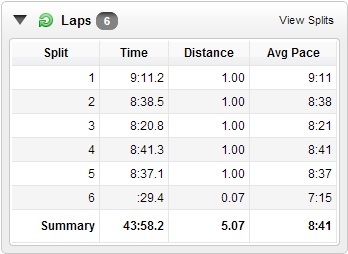 We managed a good time and some pretty good splits. Here is the Garmin activity and below are the stats. This is always a very popular race and people are out to have fun. There are the serious racers…other than being the fastest you can always tell a serious racer, they are the ones running in a singlet and shorts when the temparatures are below freezing. Not for me. Being a social race there are many members out as support on the course as volunteers which is always appreciated. My only complaint about yesterday was the water station (one station which served mile 2 and 3) which used plastic cups (not paper) and that although this was a social run the volunteers at the aid station stopped to speak to runners in front of them causing a collision for me and someone else spilling water on someones back just in front of me. Not a big deal for such a small race but in temperatures below freezing you don’t want a lot of spilt water around an aid station. We then went back home for what has been our own Thanksgiving tradition since before the boys were born. 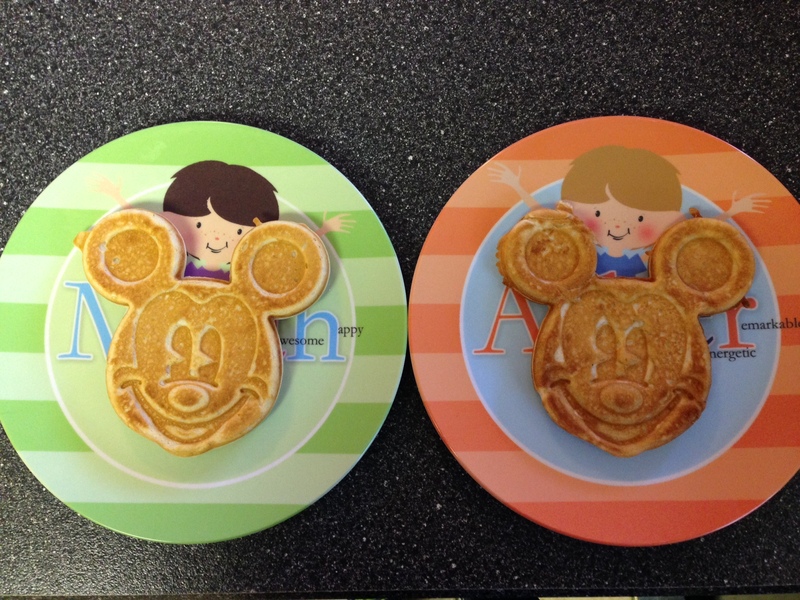 Watching the Macy’s Thanksgiving Day Parade and eating Mickey Mouse waffles. 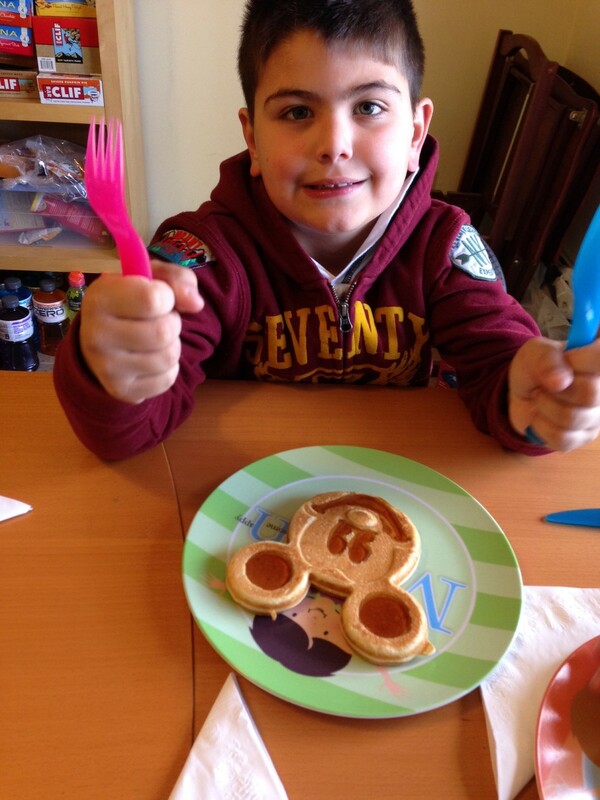 My Mickey waffle maker comes out only twice a year, Thanksgiving and snow days. The tradition continues but I may need to invest in a double Mickey waffle maker as we had additional guests this year with my parents, my father-in-law, my sister-in-law and her fiance all heading back to our house after the race. 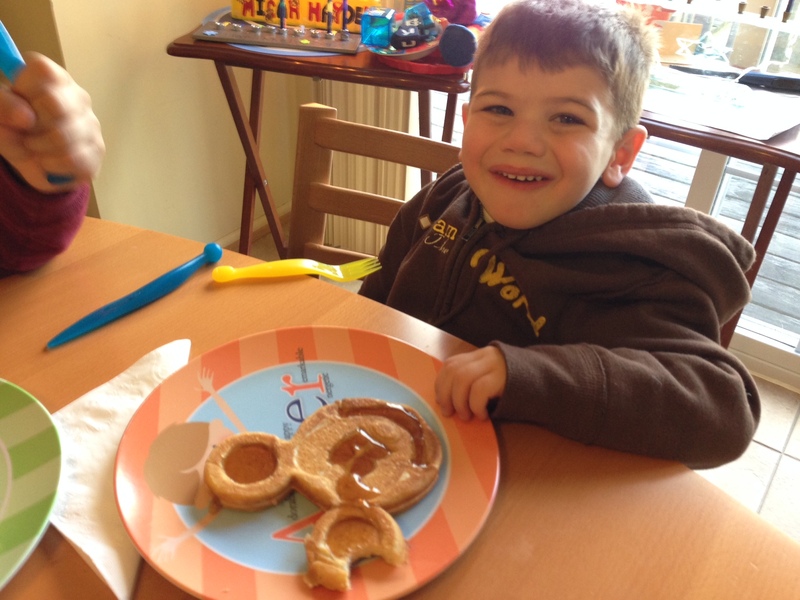 After we had our fill of waffles it was time to get ready to head out to visit our family and join in their Thanksgiving celebrations. I have lots to be thankful for. 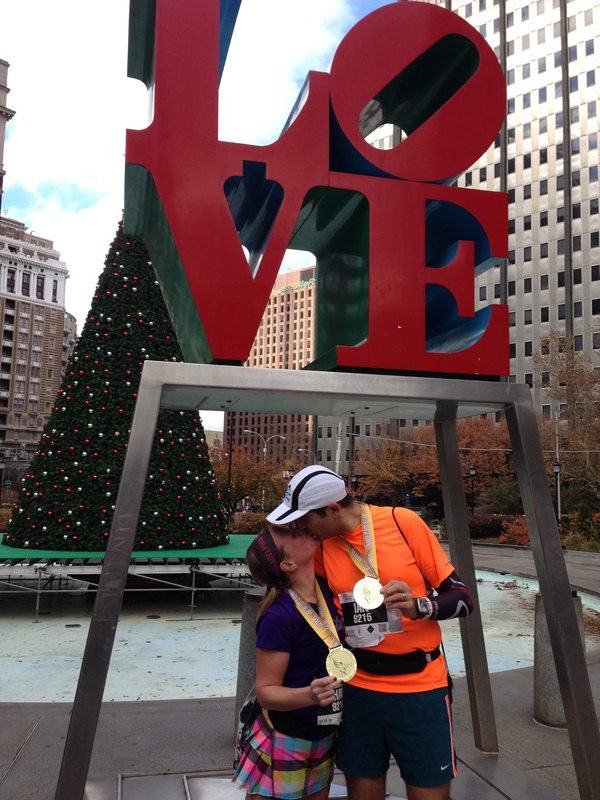 This weekend my wife Shari and I ran the Philadelphia Marathon. 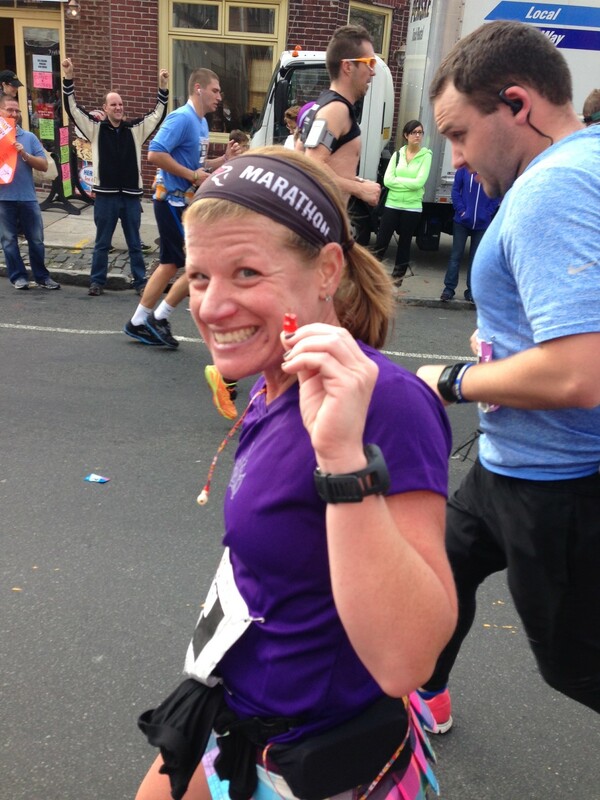 This is a very special event for me as it was my very first marathon back in 2011, it was also where in 2012 I broke 4 hours in a marathon for the first time as well is being my ‘local’ race (I live in the suburbs just north of Philadelphia in Bucks County, PA). 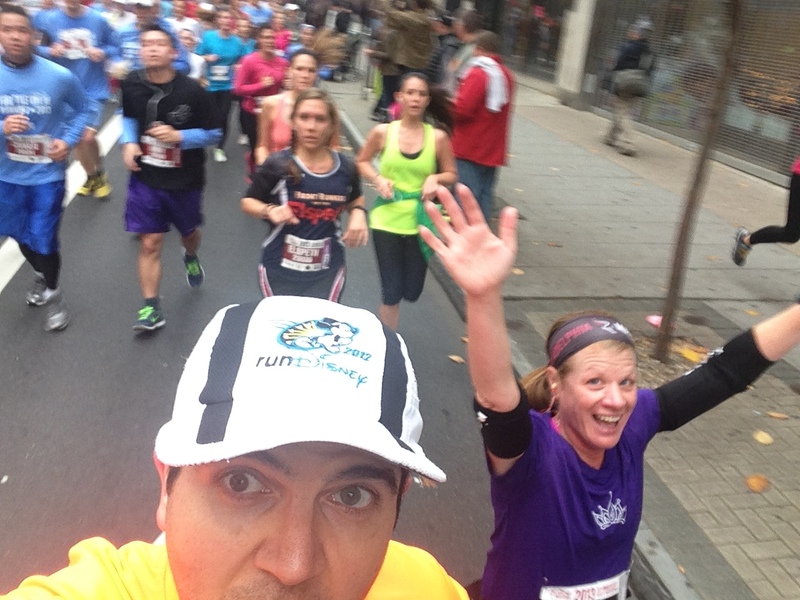 So this was going to be my 3rd consecutive Philadelphia Marathon. It was also the 20th year of the current marathon event so it was sure to be special. 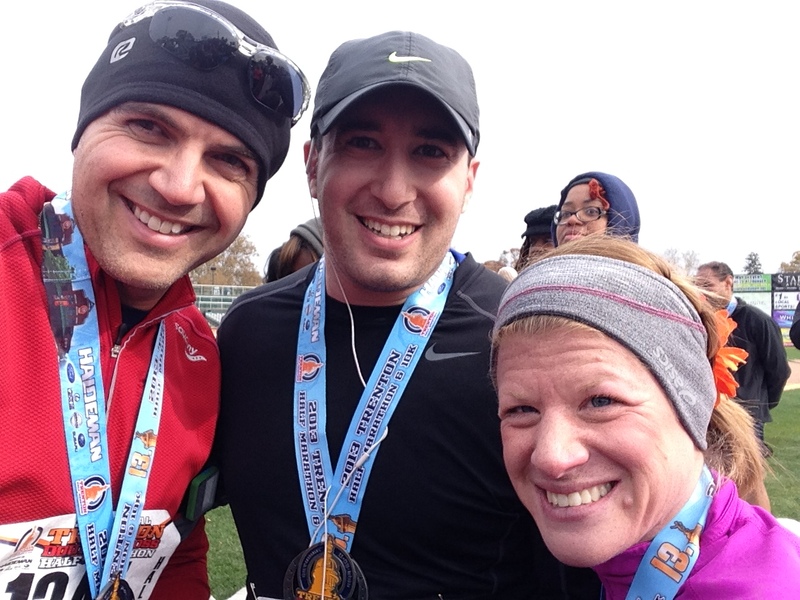 My wife ran the Half Marathon in 2012 and felt that the atmosphere for the event and the crowds she saw might encourage her to run the Full in the future. After completing her first Full marathon in Walt Disney World in January of this year I convinced her (not that she needed much convincing) to run Philadelphia and I signed us up when registration opened on April 1st. Both Shari and I trainined using Hal Higdon’s training plans, Novice 2 for Shari and Intermediate 2 for myself. This was the 3rd time I have used this plan and I’m comfortable with the training level right now. 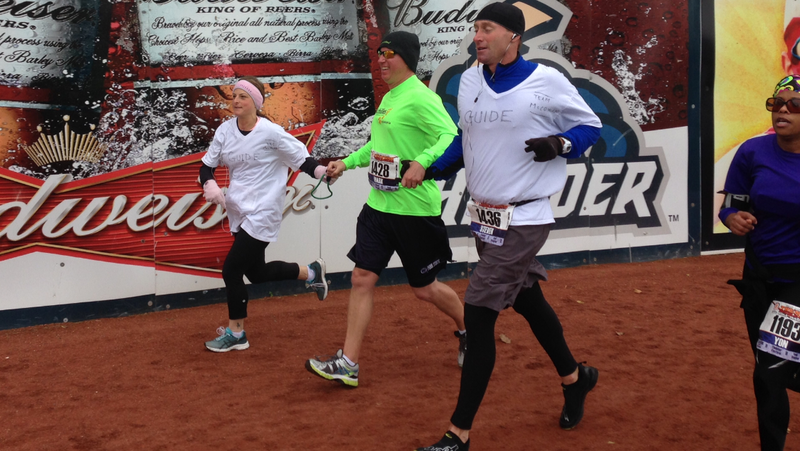 I said to Shari as we approached the race that I had no goal other than to run with her and enjoy the race. I had nothing to prove here and just wanted to savor the time. 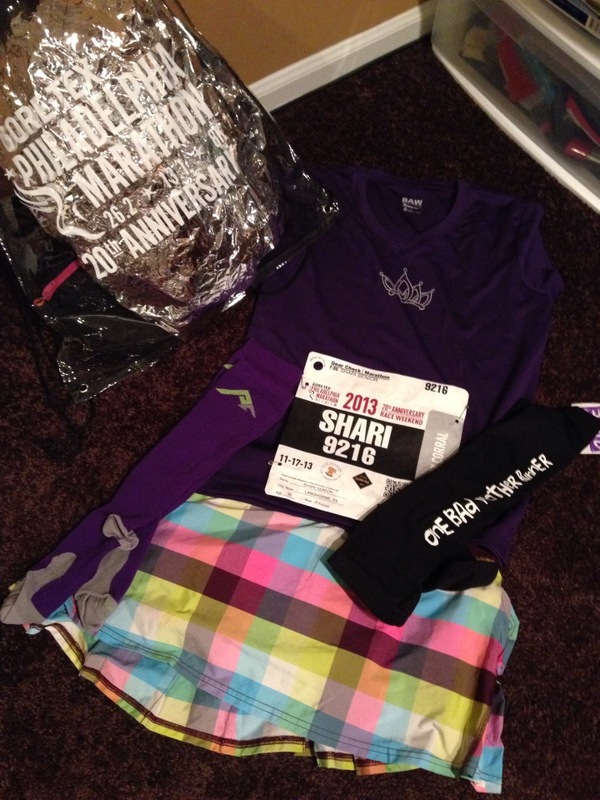 I was probably the most relaxed before a marathon I had ever been (okay, I haven’t done that many!). As race weekend approached, we, along with everyone else, watched the upcoming weather forecast which seemed to change daily. Even the day before the weather forecast was different than on the actual day. This was Fall in the North East and we had the week before experienced temperatures in the high 20s/low 30s so although it looked warmer they were predicted a little fog and rain. As it turned out it was a glorious day but more on that later. The expo itself was a little odd. As we walked in there was the usual Philadelphia Marathon banner and we took our regular photos by the banner (actually our 6 year old took the photos so we look really tall). 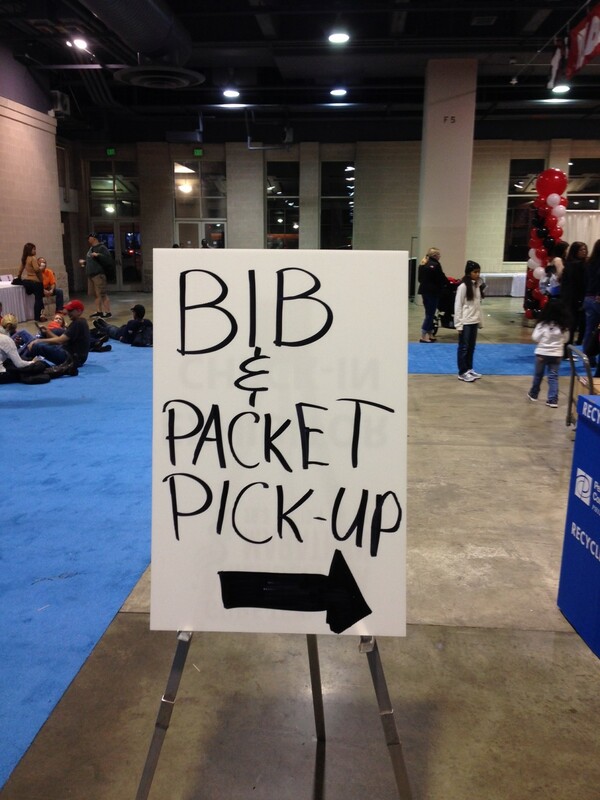 As we got through the banner there was a ‘hand written’ sign pointing us towards packet pickup. That was kind of strange. A little amateur looking considering the size of the race. It looked a bit last minute more as an afterthought for such a high profile part of race weekend. The other thing we noticed about this years expo was the setup seemed different. 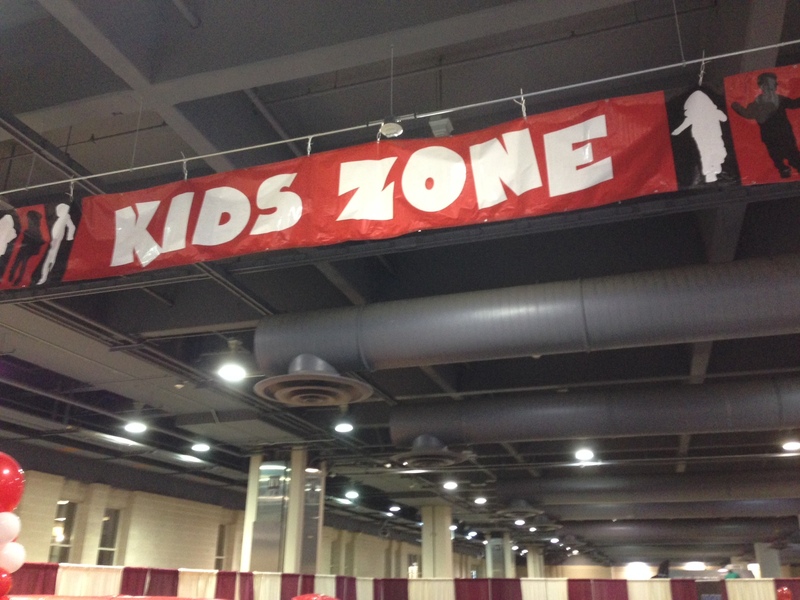 Usually we grabbed our bibs, went through the merchandise section and then out into the main expo. This year it was a little more like rats in a maze. I don’t know how else to describe it. The packet pickup was easy in itself but getting to there had a couple of turns and you were partly going through the expo at the same time. It was crowded and not easy to manouver with a stroller as some people were in line, some people were passing through and some people were looking at booths. Of all the races I have taken part in this year this was the first race where nobody asked to see my ID to confirm who I was when picking up my race packet. Given all the extra messaging around the increased need for security at the event no-one checked our bags going into the expo either. Strange. That would however change on Sunday. 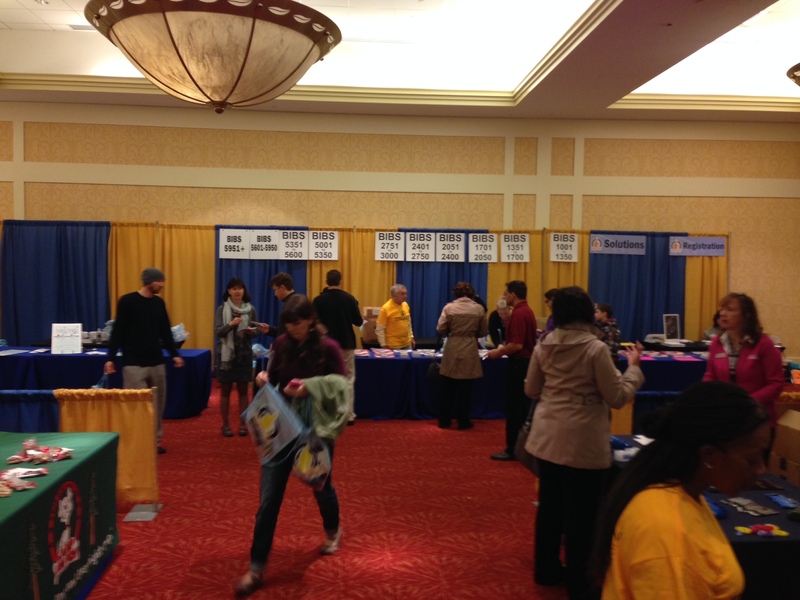 As has become the norm for races since Boston, the race organizers provided clear bags that would be the only ones allowed at the bag check. They were at least a decent size and they actually looked quite cool, mesh on one side and clear plastic on the other printed with the name of the race. The shirts this year were a light blue and I liked it. 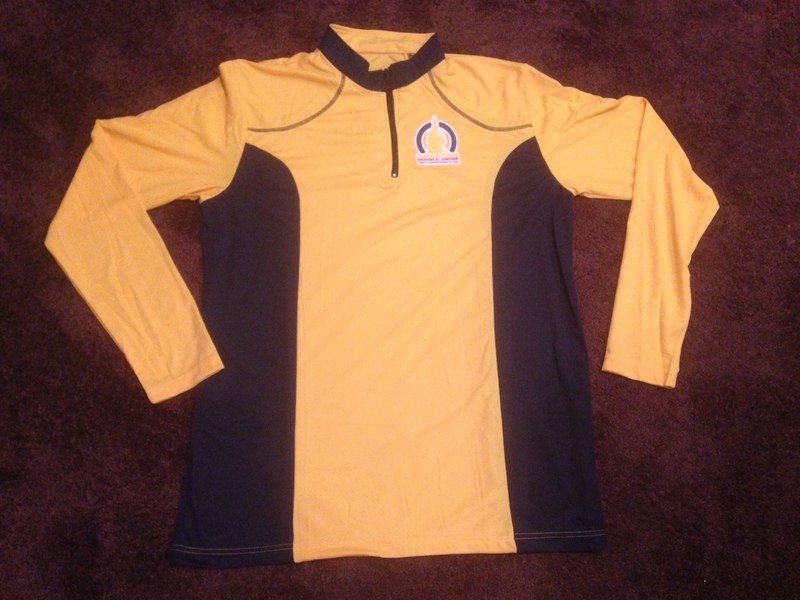 It had the words of ’20 YEARS FOR THE LOVE OF RUNNING’ written on the front with the course map on the back (as in prior years). The expo seemed a little smaller than in previous years too. Looking at the map of the expo it appeared that the booths were all perfectly in line but in reality it wasn’t as if you could walk in a straight line through the expo and I got turned around a couple of times not knowing which direction I had just come from. My wife thought the same. It wasn’t the worst expo but it wasn’t the best and we kind of had expectations for his race being the 20th anniversary event. 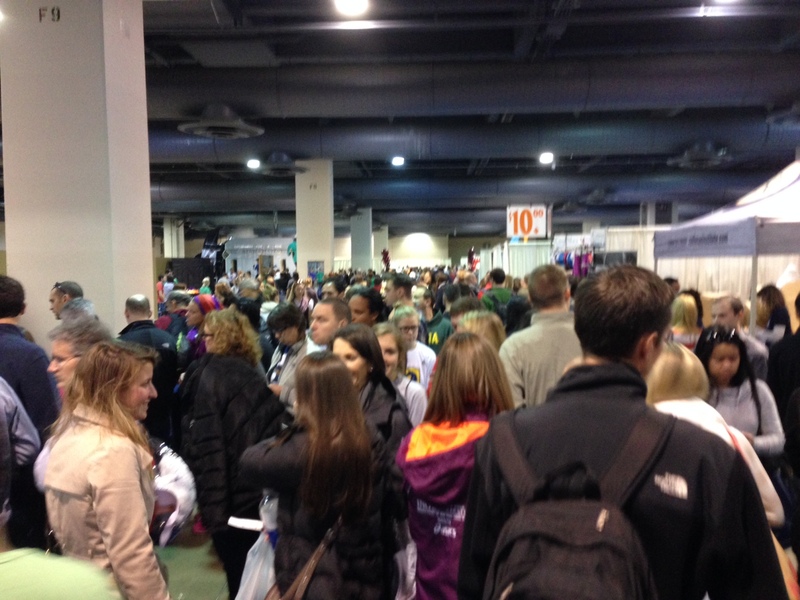 The scene at the Bib and Packet pickup area. 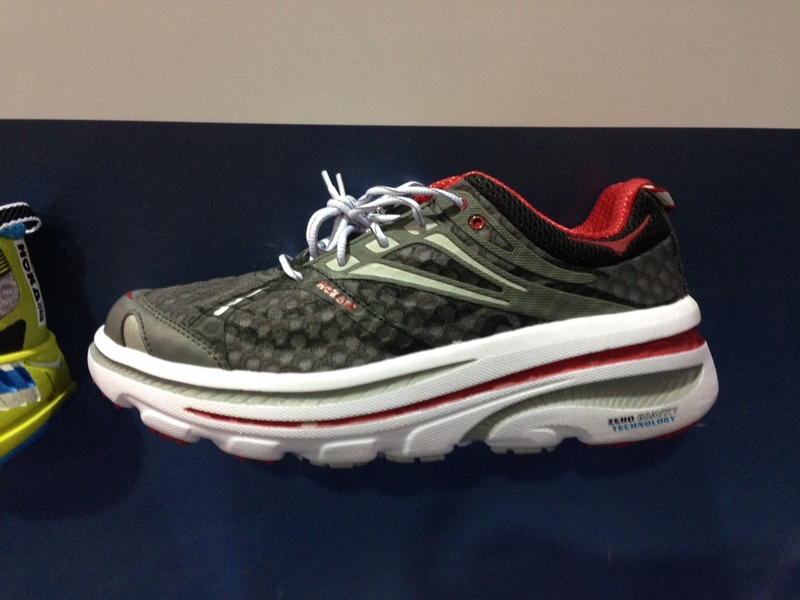 I did stop by the Hoka booth as this was the first time I had seen the Hoka shoes close up. I tried on a pair of the Bondi model shoes but I really need to have the opportunity to try them on a run to see if they live up to the good things I’ve heard. They sure look different though. Once we were done at the expo we headed home for an early dinner with the boys and to get ready for race day. As usual we laid out our gear the night before. 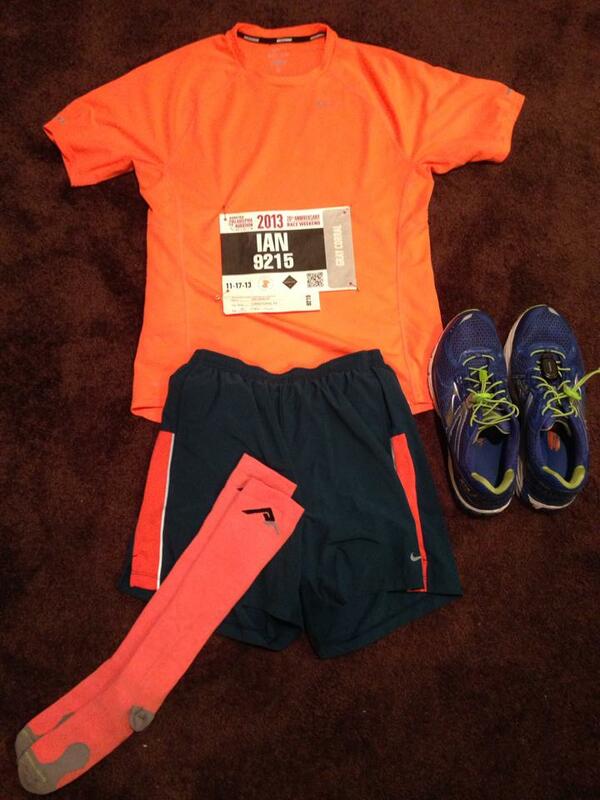 As we were running as a couple we tried to coordinate colors…because you have to! 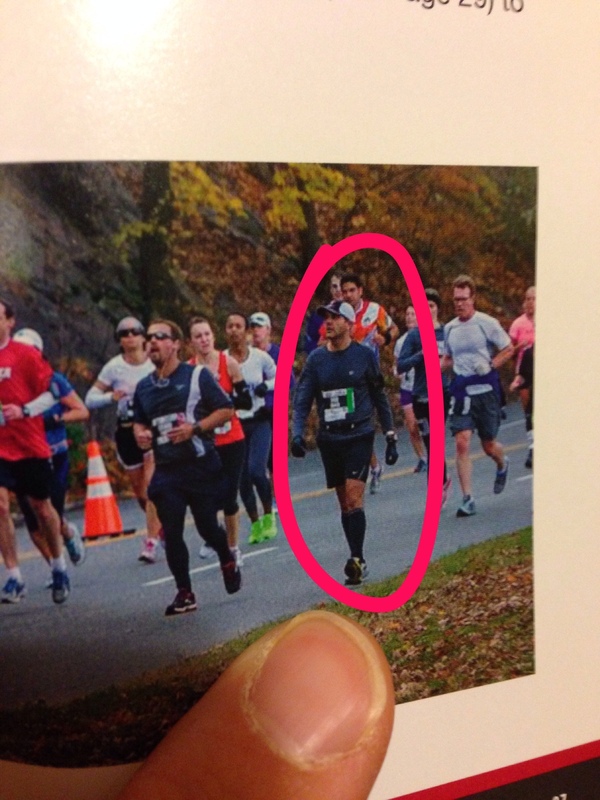 Also, we looked over the race guide that was in our packets I was pleasantly surprized/shocked to see a picture of me in the program. We are not new to this free publicity as my wife made the program of the 2013 Walt Disney World Marathon Weekend program and we are on the banner of the Atlantic City April Fool’s Half Marathon but the picture of me was from last year’s marathon. 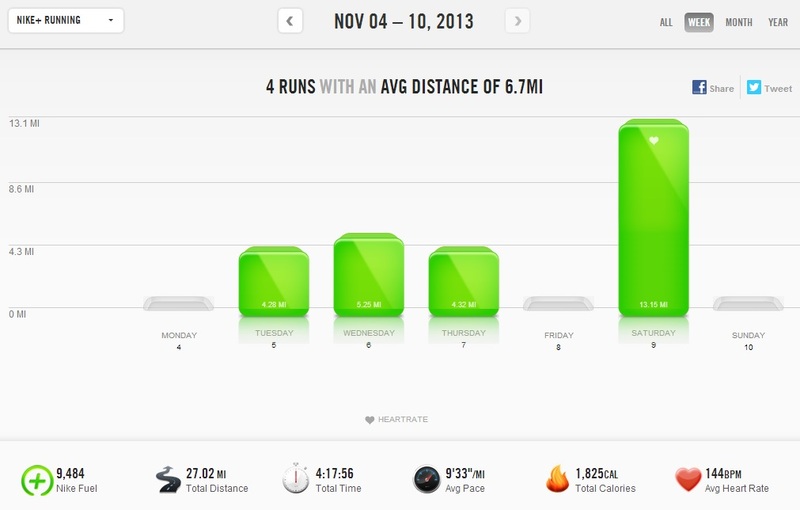 As you may know from reading my blog I use Jeff Galloway’s run/walk/run method to good effect. The picture in the program was a picture of me walking…the only person walking in a picture of everyone else running…oh no!!! Still, I broke 4 hours in the marathon last year so whatever you think from the picture, the result was what I wanted and I can live with the embarassment 😉 My wife didn’t even notice it was me and she specifically looked for us in the program (thanks Honey). Still annoyed about my loss of my Powerade Zero I was pretty annoyed when I saw plenty of people with Camelbak hydration packs and Gatorade bottles (I was beginning to believe it was an anti Coke product bias at this stage) we made a quick pit stop and then stretched out. 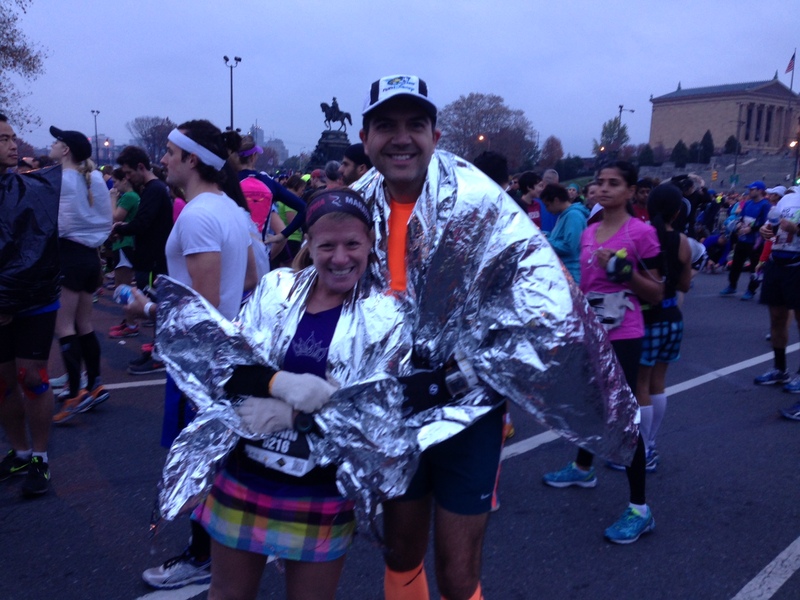 We had brought our space blankets from last weeks Trenton Half Marathon to keep us warm at the start area as the temperatures were predicted to be in the 50s by start time. We walked a little further up towards the corrals and bag check and decided for one last pit stop before checking in our gear and heading to the corral. Wow. All I can say is wow. So, they increased registration this year to almost 30,000 runners and it seemed they had less port-a-potties than in prior years. We were in lines that zig-zagged up and back across the field. After being in line for over 30 minutes we had a minor mutiny on our hands and when we circle a tree to what seemed like the end of a line only to find it continue around again, so a few people in line just formed another line and monopolised two potties. Ugh. I didn’t want to start all that again so we joined the mutiny (although one lady in a parallel line gave us such a dirty look!!!) Not fun. We checked our bags and made it to the corrals just as the National Anthem was being sung. Start time was minutes away. Our Corral was finally brought forward and given the word to ‘Go’. At the start line (and finish line) the Mayor of Philadelphia, Michael Nutter, is there to high five runners as they pass by. 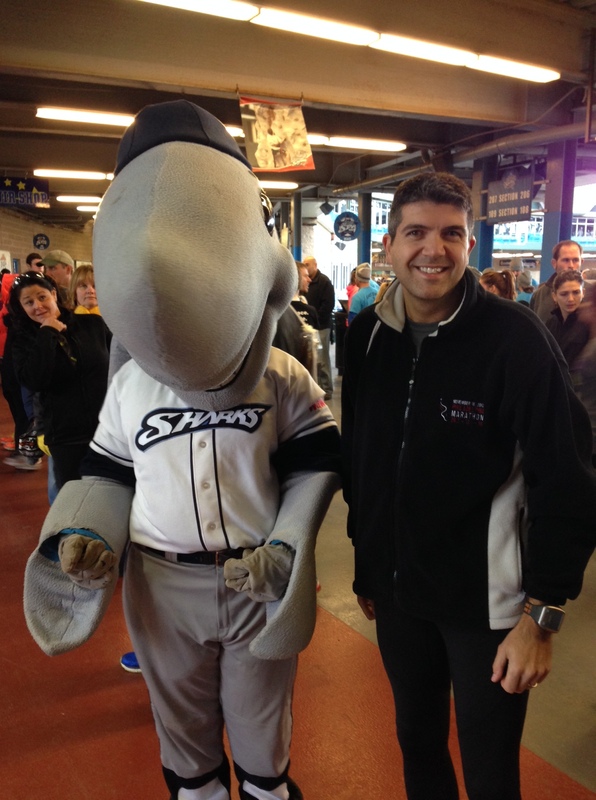 I’m sure not many big city Mayors come out to support the runners but it’s great that he does. Last year I got high fives at the start and finish. This year Bill ‘Boston Billy’ Rodgers was also at the start line giving high fives out. We tried for that but failed miserably as I didn’t spot him amongst the crowds. Oh well…I got a high five (and a good luck kiss) from my Wife which is way better. The one thing that I will always say about this race is that it has great crowd support. From the start line to the finish line (with only a few exceptions in the second half of the race) the crowds a many people deep and very vocal. Awesome stuff. The race is very scenic taking in many sites and neighborhoods. The first half is a different course than the Rock and Roll Philadelphia Half Marathon which shares the same start and finish line area. 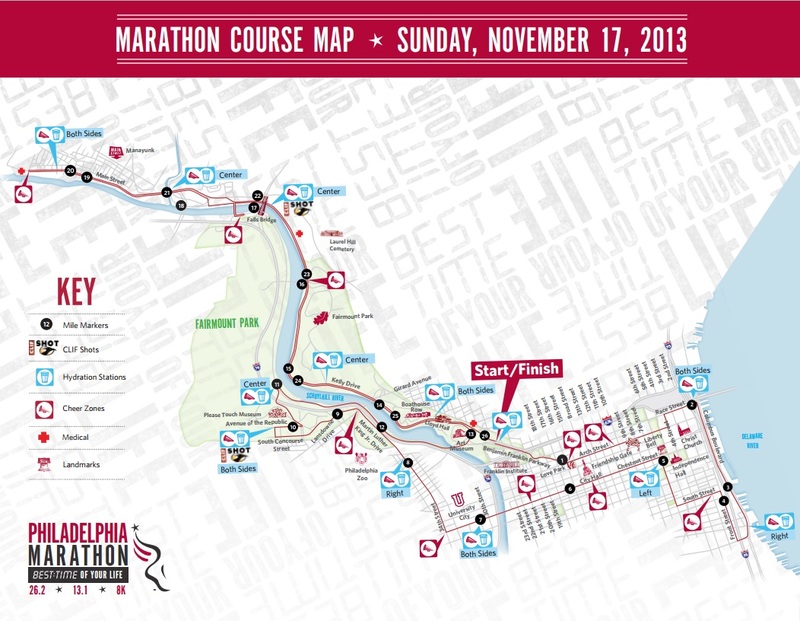 Here is the course. 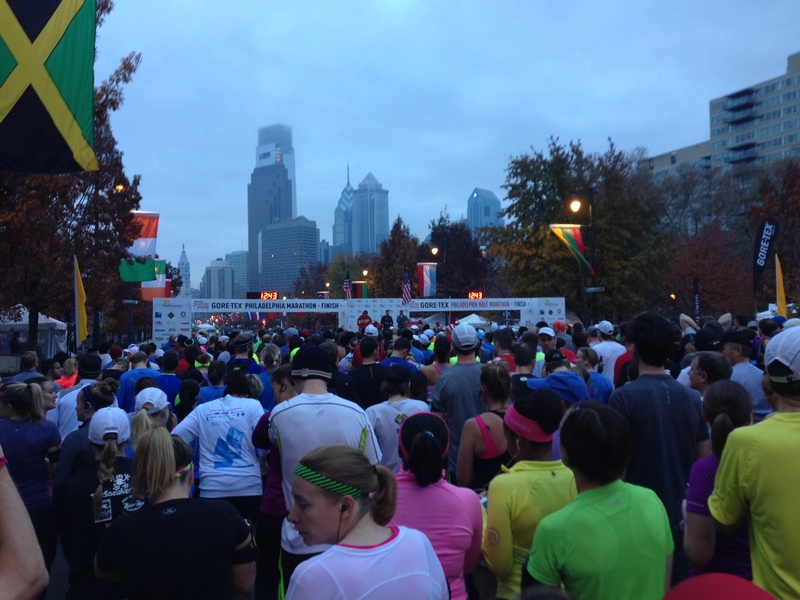 The course at the start and for the first few miles was pretty tight as we were running with the Half Marathoners as well as the streets in Center City Philadelphia being fairly narrow. There were a lot of straights to run in the first few miles and crowd support was there alongside us. 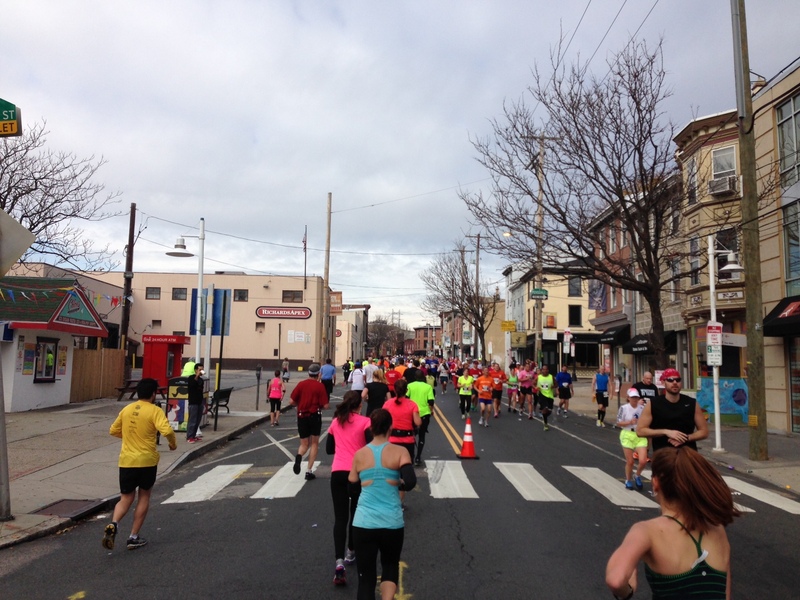 One of my favorite areas is to run up South Street and Chestnut Street. There was a DJ out on South Street last year but none this year but that was okay, we came to run and were having our own little party anyway. 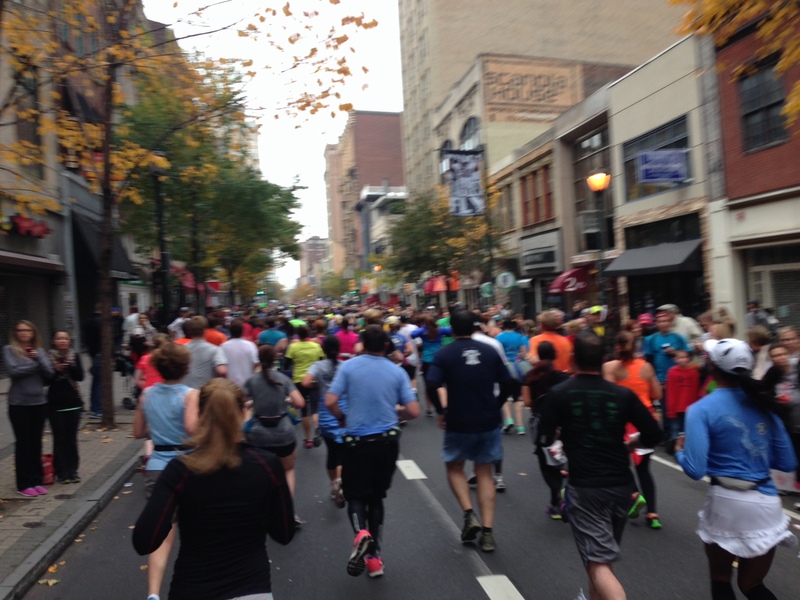 Running up Chestnut Street is awesome. Imagine a long narrow tunnel of just people and then send a crowd running through them. A great atmostphere. The run along Chestnut Street is almost 2.5 miles straight up. You pass by 30th Street Station and up past Drexel University to what is the first (and probably longest) hill of the race. Once you reach the top you run past lots of Frat and Sororety houses and around past the Philadelphia Zoo. Luckily the wind was blowing in the right direction and you couldn’t ‘smell’ the Zoo as I had in prior years 🙂 The students living in the houses were out in support (and I’m sure a little beer was on offer). 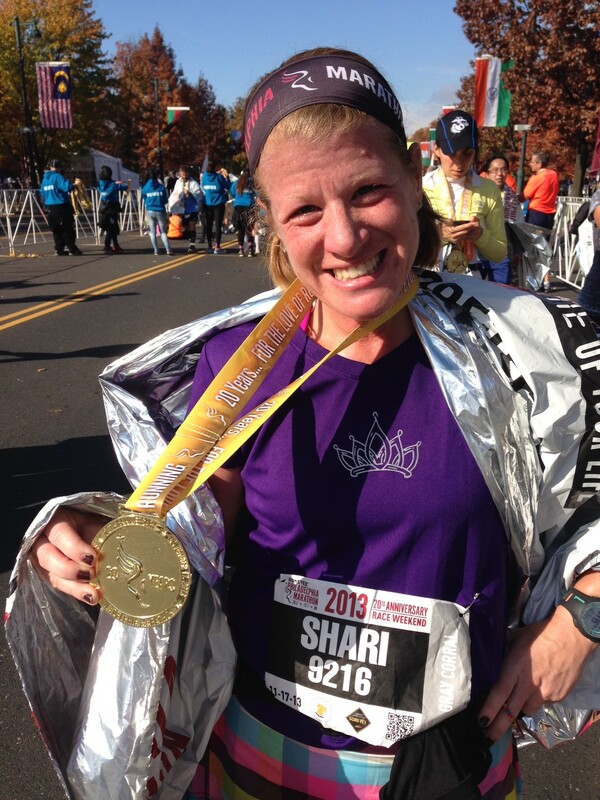 It was around this part of the race that Shari began feeling a little uncomfortable with her knee. She has a little IT band issue from time to time and this had set her back a bit missing a couple of long runs half way through her training. She pulled a small tube of icy/hot out of her SpiBelt and massaged some of it into her knee and onto her IT band (believe me, that SpiBelt is like Mary Poppins carpet bag…you wouldn’t believe the amount of stuff she was carrying in there). After a couple of stretches were were on our way. Shari was doing okay keeping together with me. She was following the run/walk interval that I had trained with even though she herself doesn’t train this way. We were using a 4:00/0:40 run/walk ratio and that broke things up well. We were averaging just a little more than 10 minute miles at this point and were feeling okay. After the Zoo we had the second toughest hill (shorter and more intense) up to the Please Touch Museum (Memorial Hall) in Fairmount Park. Once you get past this hill the rest of the course is not anyway near as demanding (although you still have another 17 miles to go at this point). Shari mentioned to me that it was at this point in the Half Marathon last year that she felt it was a little tough but she was much better this year and was happy with how things were going. This was also the location of the first Clif Shot station. I had only packed 4 gels for the marathon (my strategy was to take a gel at miles 5, 10, 15 & 20) so I decided to grab an extra which I never usually do. 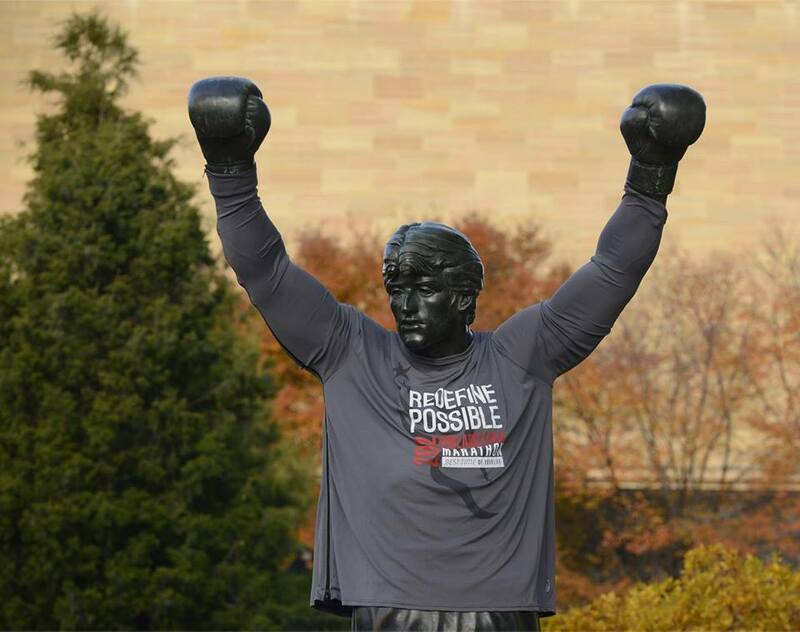 We did go a little slower down the hill onto West River Drive but then held a steady pace up to the halfway point where we left the Half Marathoners at the finish line exit and looped around the front of the Philadelphia Art Museum just past the statue of Rocky Balboa (from the movie Rocky III). The second half of the course is an out and back to Manyunk with a slight detour across the river and back to pick up a couple of miles in distance. It was at this stage that I feel like the race was on as we start seeing runners on their way back up to the finish line. We just missed the lead runner for the men’s race but saw the some of the elites running in as we were just starting mile 14. We also saw the first female runner on her way back in. It is always impressive to see how these folks leave it all on the course and their focus and determination in their eyes. I should also mention that we also saw Elvis…yes, you heard me right. Once we cleared the bridge we started to head up into Manyunk proper. Shari started to feel a little uncomfortable again and stopped to put on some more icy/hot cream. These were our 2 slowest miles of the marathon as we did these at a 12 minute mile pace. We were close to Manyunk itself which I had promised her was going to be a high point of the second half of the race as I had remembered the lift from the crowds from my previous experiences. The run up and back through Manyunk is slight uphill/downhill but was not overly difficult although when you are running miles 19 to 21 it may seem to some like Mount Everest. We found it fine for us although we could see that a few were hurting and hitting the wall at this stage. However, for those with depleted carbohydrate stores Manyunk is the place to be. As we ran into the town we were immediately offered refreshments at a beer station. Plenty partook but we decided to pass and head for the Gatorade and water a little further up the street. People were handing out orange segments to runners which I somehow managed to miss and was so distracted at this stage that I took my last energy gel at mile 19 instead of 20. Oops.. Luckily I had picked up a couple more gels at the last Clif Shot station and may actually have ended up with as many gels that I started with. Oh well, I am fully stocked for my Dopey training. The crowds in Manyunk are awesome. Essentially you run up and down Main Street and the side walks are lined with supporters and people sitting outside cafe’s and restaurants watching. People were handing out brownies (seriously? you are going to eat a brownie from a random stranger mid race?) and Gummy Bears which Shari gladly took (hopefully she didn’t use the icy/hot hand as those would be some interesting tasting Gummy Bears). At the turnaround point you start to run downhill and it is the last big change of direction you make in the race as essentially you have 6 more straight miles to go from here. Now it was heads down to the finish. Not much more to see on the course as we were retracing our steps back to the Art Museum and the finish line. Shari was concentrating on her form so she could run comfortably. She didn’t stop to stretch but just ran focused. She was pretty quiet at this stage and I was my usual chatty (somewhat annoying at this stage probably) self. I was having a ball. I was very relaxed, although I could feel my left ankle a bit it wasn’t hurting and I was just enjoying the sunshine, the run and the pace. We were almost home. 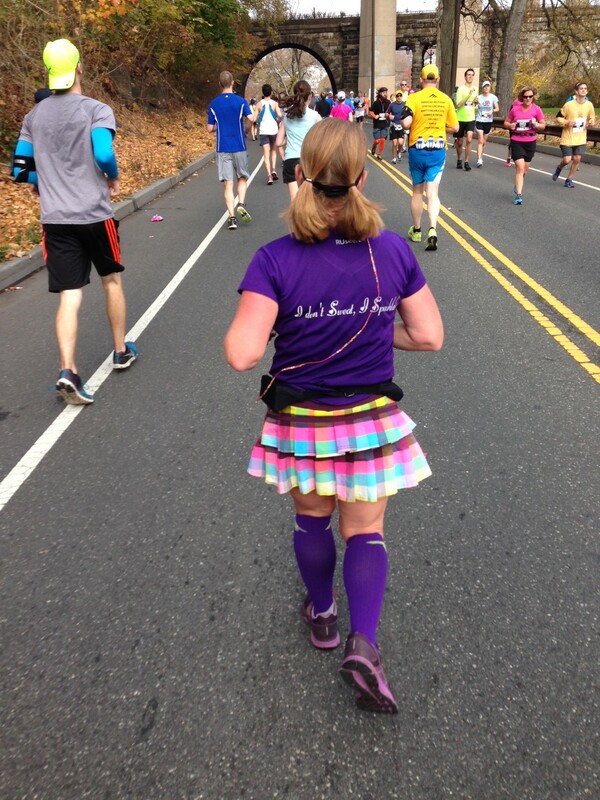 As we approached mile 25 I sensed Shari started to pick up the pace a little and we decided we would skip the last walk break if we felt okay. I don’t think either of us was planning on a sprint to the finish, at this stage the goal was to cross that line. Just as we reached mile 26 we did pick up the pace a little more but it wasn’t a sprint. Shari told me after the race that just as she reached that point her leg buckled a bit and she had a quick “oh no, not now” moment but held on to the end. As we approached the finish line we both went towards the Mayor and got our high fives (we had earned them) and crossed the finish line hand in hand in a time of 4:45 (a 45 minute PR for Shari). After clearing the food line we went to try and get our finisher photo noticing that it was on the other side of the food tables. As we tried to approach for our picture a volunteer blocked our path and said that noone was allowed back up into the finish line area. We told him we were directed by another volunteer to the other side to grab refreshments and that we only wanted to get our photos taken but he refused to let us go back for security reasons. Yes, it must have been the banana and water I was holding that seemed threatening. What was that all about? We were still inside the security perimeter. 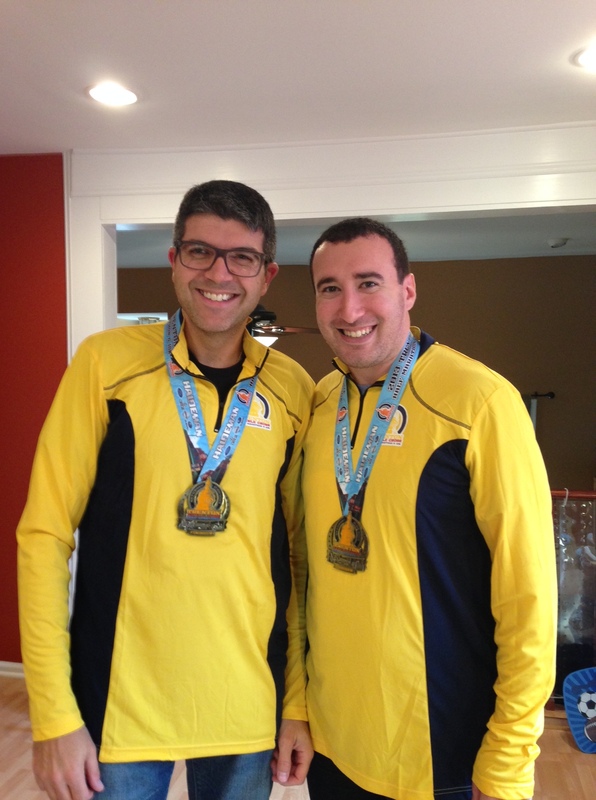 Had it been our first marathon and we really wanted our photo taken we would have been really disappointed. 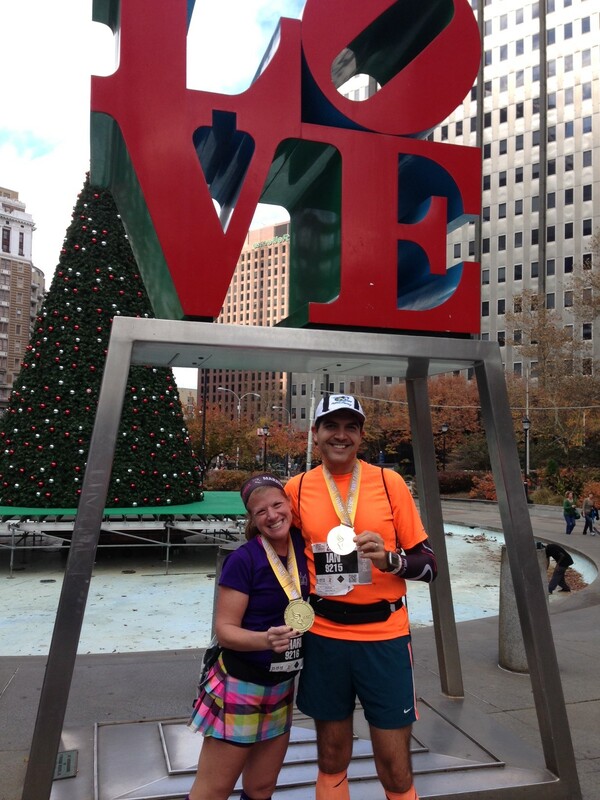 One of the goals we had for the weekend was to take our picture at Love Park just beyond the finish line area. We noticed as we excited the security perimeter that there were guards blocking people outside. Last year when I ran the Full and Shari ran the Half she had a couple of hours to wait and had walked a couple of blocks to Starbucks to grab a coffee. Had she done that this year she would not have been able to get back to meet me at the finish line. What a difference a year makes. And we finally made it to Love Park. Thank you for reading (what was a real marathon of a recap). 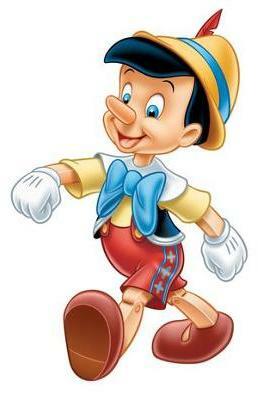 There is no week in review or training update this week (although the Dopey Challenge is about 50 days away). 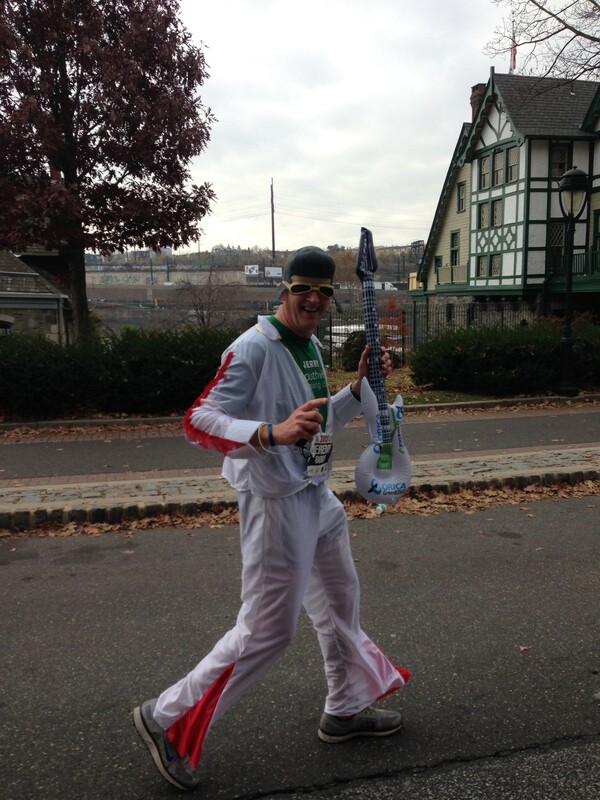 I will be writing up my race recap for the 2013 Philadelphia Marathon shortly and will post this as soon as I can. 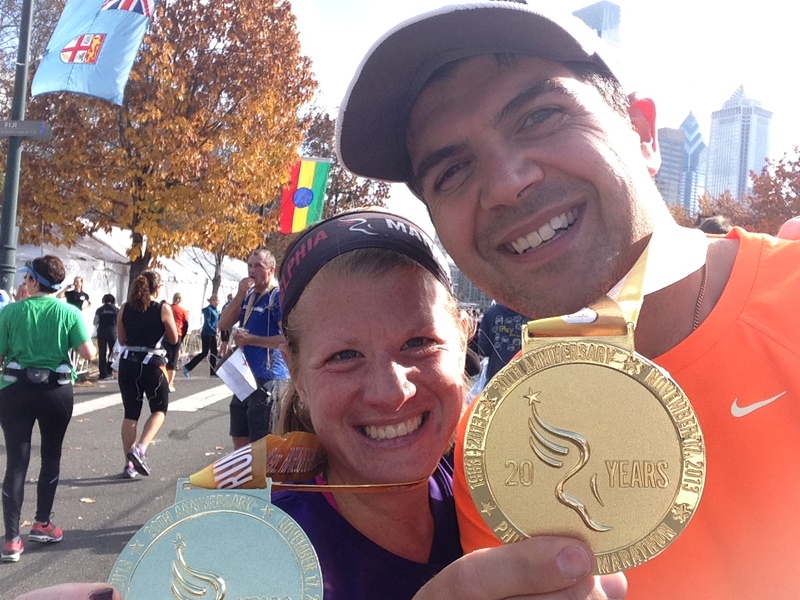 This is just a quick post today to say that my Wife and I ran the marathon yesterday and had a great time. 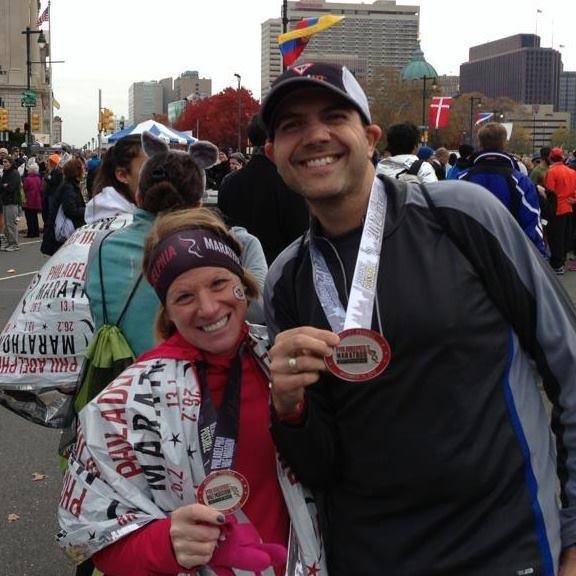 It was her 2nd Full Marathon and my 6th. I’m hoping we get to run a few more together as it was great to be with her step by step for the whole course. 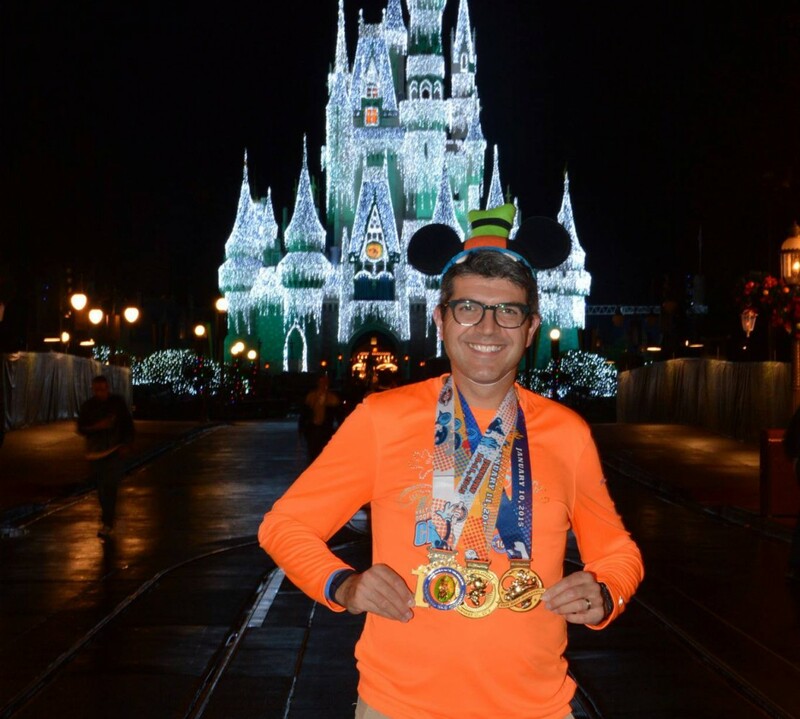 8 weeks from today I will be heading down to Orlando to take part in the 2014 Walt Disney World Marathon Weekend, specifically the inaugural Dopey Challenge. This is a four day event from Thursday January 9th through Sunday January 12th and consists of a 5K (3.1 miles), a 10K (6.2 miles), a Half Marathon (13.1 miles) and a Full Marathon (26.2 miles) for a total of 48.6 miles. 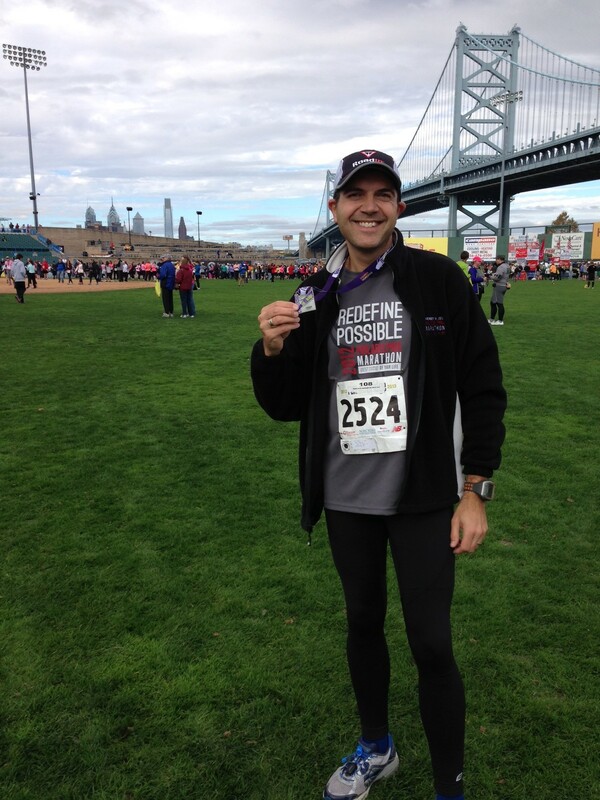 This weekend I am running the 2013 Philadelphia Marathon and after this I have less than 8 weeks between this event and the Dopey Challenge in which I need to build in recovery time, ramp up my distance and taper again. This is a pretty short span of time (unless you are one of those folks who runs multiple marathons a year). I actually have done this process twice before, I ran the Philadelphia Marathon in November 2011 and the Walt Disney World Marathon 8 weeks later in January 2012 and I ran the Philadelphia Marathon again in 2012 and ran the ‘Goofy Challenge’ 8 weeks later in January 2013 (Philly2Goofy!) and will pretty much be using the same approach this time. The first time I did this I used Hal Higdon’s 8 week back to back marathon plan just as Hal designed it. I changed it up a little for the 2013 Goofy Challenge so that my Saturday runs would be exactly half the distance of my Sunday long runs to try and mimic the Half plus Full scenario. Training, in addition to building endurance and general well being, is the place to simulate and practice race conditions. The small modifications for the Goofy were simple to slip into the plan as it just meant adding a mile or two the day before the long run. Dopey training calls for a somewhat different approach. Although I plan to similulate the 4 day event by doing 4 consecutive days of running, I still need to build in some recovery time, some rest time and some taper time. With that in mind I adjusted Hal’s program slightly to similuate race week just twice during the training plan but these will be on the longest distance weeks to make the training most effective. See below. I think the key to this training plan is to take advantage of as much rest time as the plan allows. I have used Hal’s Intermediate 2 Marathon Training Plan for my last 5 marathons and the back to back plan follows a similar pattern with the exception that Mondays are rest days vs cross training days. The plan still calls for 5 days of running each week with the same pattern of a semi-long run each Wednesday and the long run on Sundays. 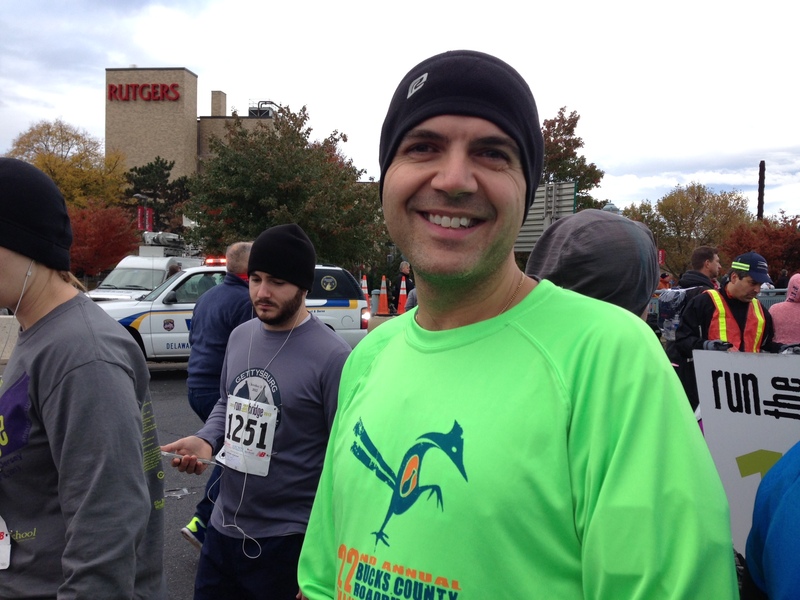 I also allowed myself one race (the Thanksgiving 5 miler for the Bucks County Road Runners). I’m getting pretty excited about this now. I have reached my fund raising goal for Team Up with Autism Speaks so that pressure is now gone (but not the pressure of completing the 4 day event of course) and I have chosen to run both the 5K and 10K in costume (yeah…not sure how that is really going to work out) and the Half and Full Marathons in ‘Team Up’ gear. At the end of the day very few people are running these events to PR. 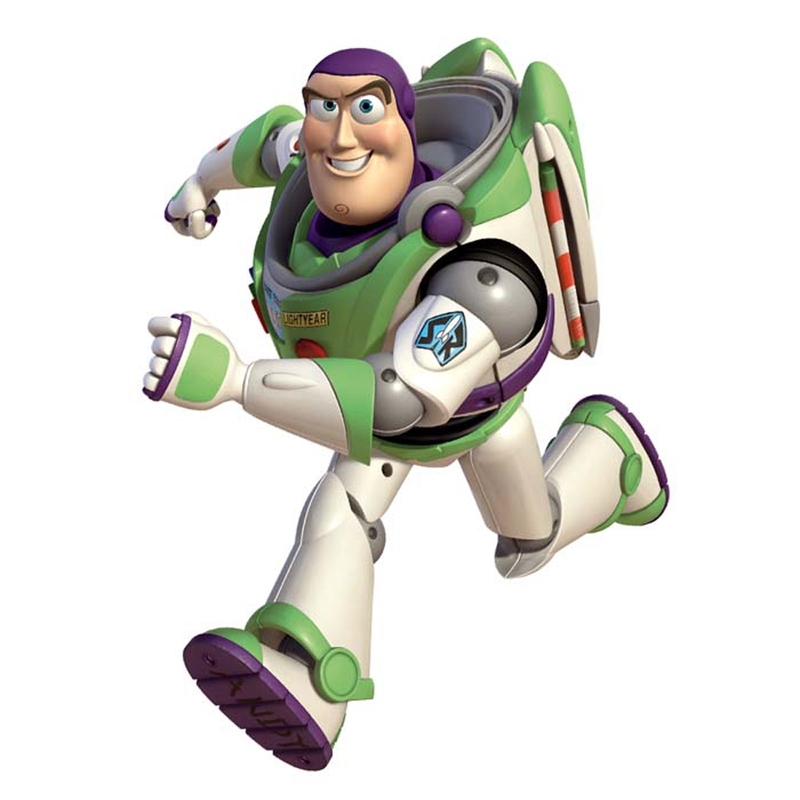 This is a Disney race where there is so much atmosphere and entertainment along the courses to take in. Not to forget the toll that 4 very early mornings will take on the body in addition to the events and some park time (I know, that is all my personal choice). My goal is to finish the event with a smile on my face with great memories and most importantly knowing that I raised money for a worthy cause. PRs can wait for other times. This event is going to be fun. I’m not saying that this plan works best for anyone other than me but having used it a couple of times I am comfortable with the approach and hope to stay fit and healthy enough to get to the start line and to finish the event. 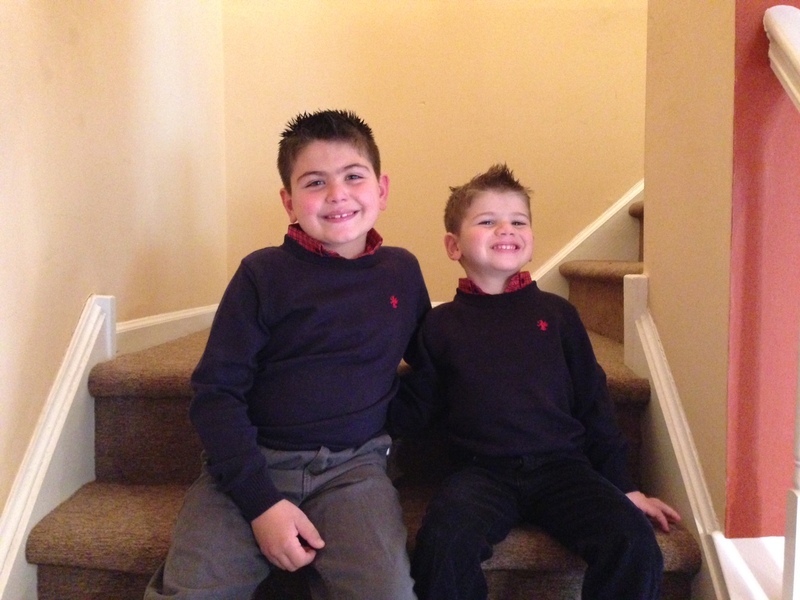 My travel plans are fixed, I have my advanced dining reservations (including a character dine) and I am looking forward to buying lots of presents for my two little boys who will be cheering my on from back home in Pennsylvania). I look forward to meeting up with all my Facebook friends who are also taking part in the Marathon Weekend and look forward to meeting new people and seeing my favorite characters out there on the course and in the parks. This will be my third consecutive Walt Disney World Marathon and ultimately my second Goofy (as a matter of doing the Dopey too). Lots to look forward to over the coming weeks. Week 17 is done. We are essentially there. Only one more week to go and three short runs to do over the week (3, 4 miles and a 2 mile shakout run) before the big day. The main plan this week was to follow the schedule, take some time to rest and relax and stay healthy. I will be taking in my usual dosage of Emergen-C in the week leading up to the marathon but this week was focused on the taper. 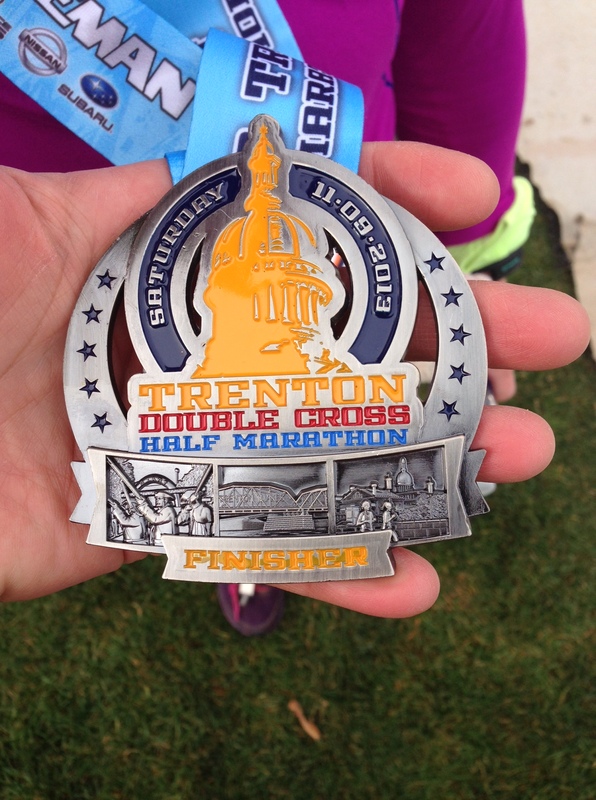 The week called for 5 runs (4, 5, 4, 3 and 8 miles) but as my wife and I ran the Trenton Half Marathon on Saturday I decided to run the 13 miles for the race in place of the 3 and 8 mile runs over the weekend. This allowed me to have an extra couple of rest days leading up to marathon week. On Friday I did go out around lunchtime and walk a couple of miles around the campus at work to keep loose and to burn off any nervous energy. Taper mode isn’t always easy but I have to say I feel very relaxed going into the marathon this year. My goal is to enjoy it. 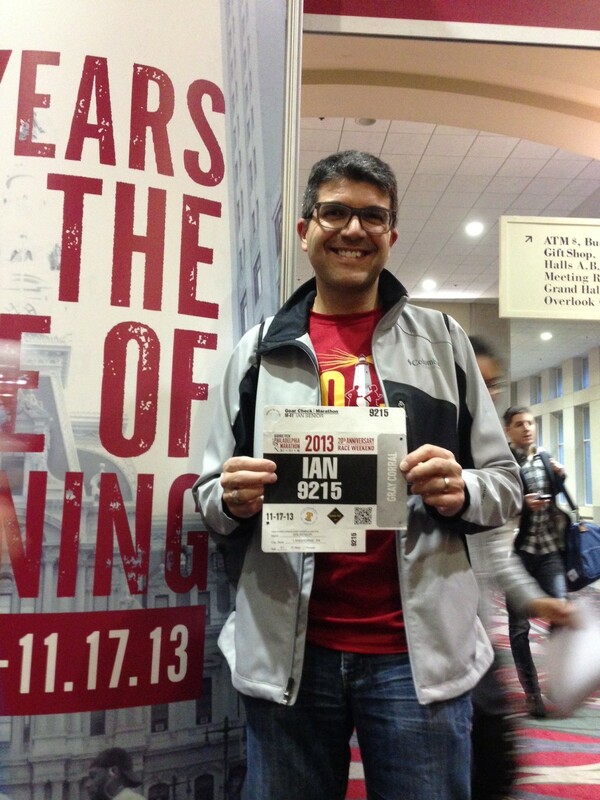 In 2011 the Phiadelphia Marathon was my first marathon and I was tremendously nervous. 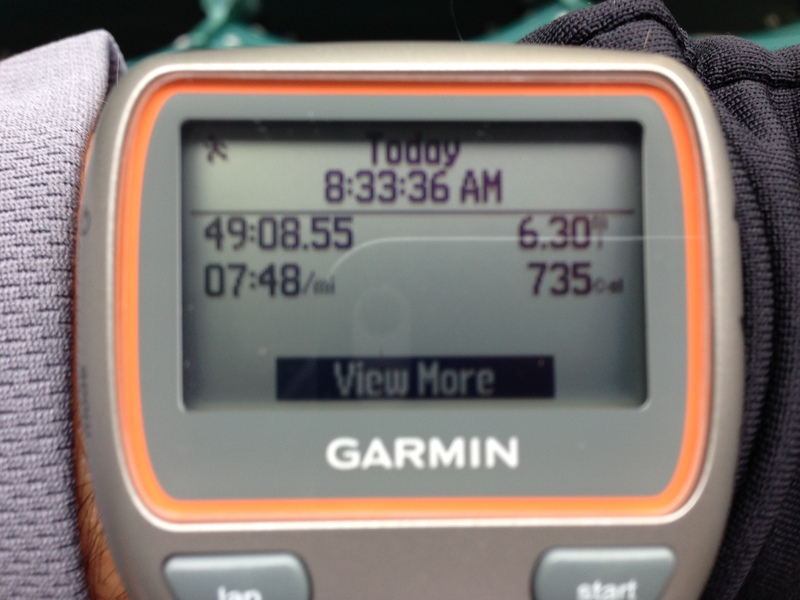 In 2012 I put myself under a little pressure with a time goal to beat 4 hours (which I did at 3:59:05). This year I’m running with my wife. 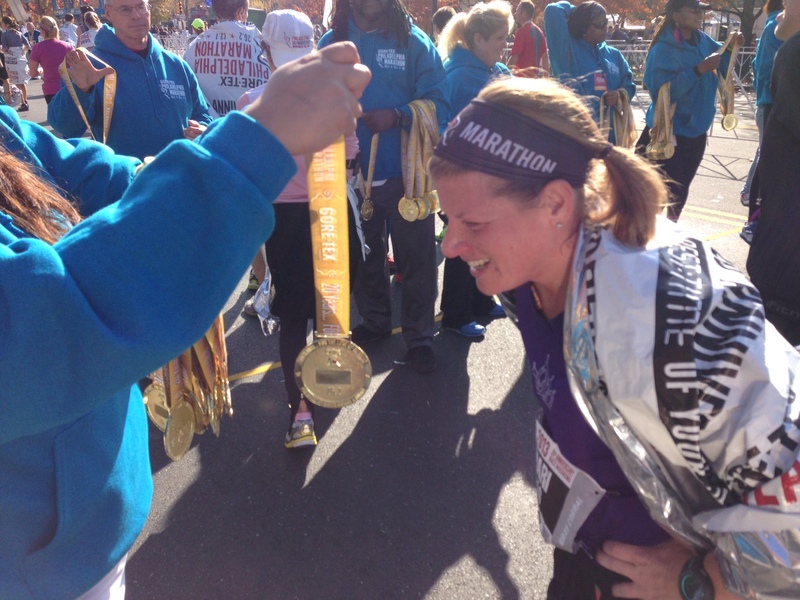 It will be her second and my sixth marathon. I want to get through with a smile on my face and both of us feeling good. After all I have the Dopey Challenge coming up 8 short weeks later and want to stay healthy for that. Weather wise this week it was all over the place. 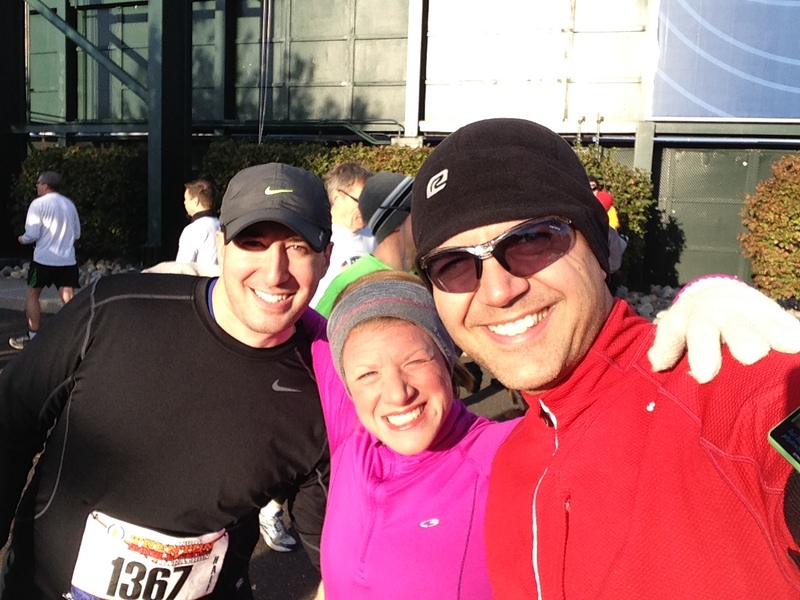 I was in winter gear last week, ran in shorts mid-week and ended up running the half marathon in near freezing temperatures. They are predicting a snow flurry next week but it looks like the temperatures will be similar on race weekend as they were last week. Hopefully as comfortable. Not much to do this week except try and bank some sleep before the weekend. I’m sure before next weekend I will be getting a little more antsy but this is more with excitement than nervesnous (I hope). 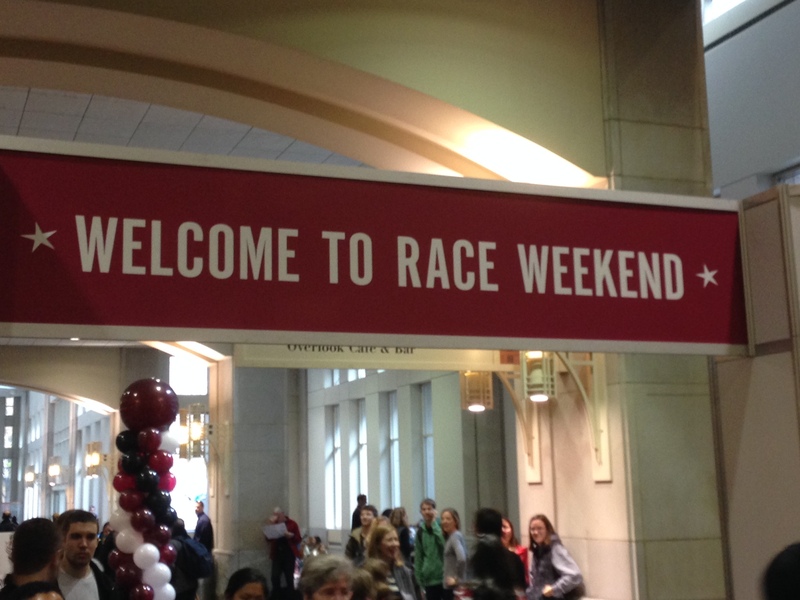 My goal is to be writing a great week in review next week and a great race recap. The motto for today’s race was ‘do no harm’. 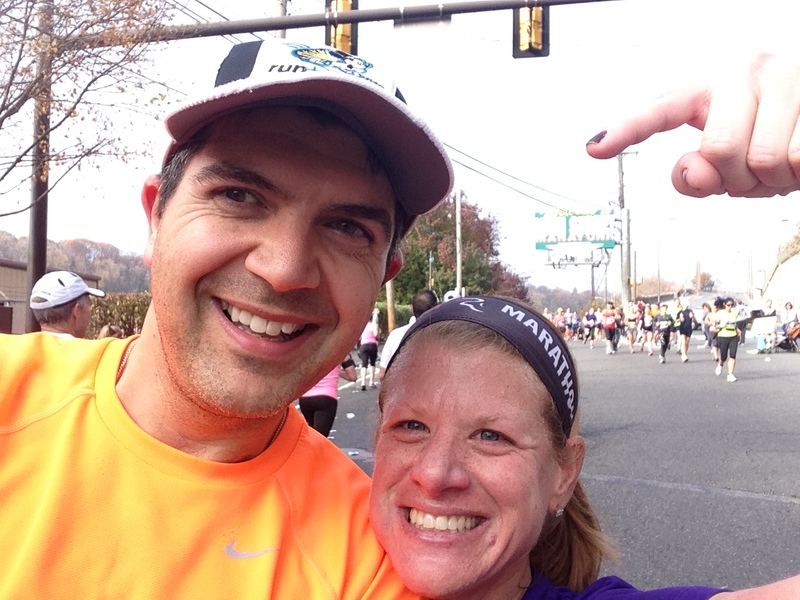 My wife and I are a week out from the 2013 Philadelphia Marathon and we decided to sign up for this race as a way of practicing running together under race conditions before the marathon next week. Usually we wouldn’t schedule a race this close to a big event but seeing as this was just over a week from the big day which would allow for a couple of extra rest days and the fact that one of use has done something ‘Goofy’ in the past we thought we could pull it off. What a great race. I will go through the details in this recap but overall it was such a nice event. Very easy expo, great souvenir race shirt, easy logistics (well somewhat), close to home (20 minutes from my house) and the sun was shining. What more could we ask for? Packet pickup took place on Thursday and Friday (although they pretty much set up the expo again outside the stadium this morning). It was pretty easy to get the packets picked up and I did so for me, my wife, my (future) brother-in-law Mike and a work colleague and her husband. I was pretty much in and out of the expo in under 25 minutes and that included a tasting of some kind of chocolate milk(?) 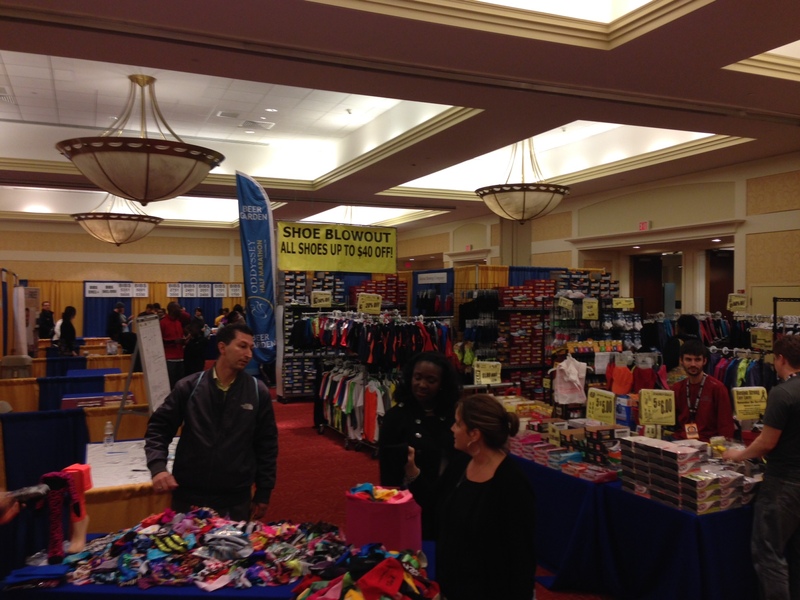 and picking up a couple of odds and ends at the National Running Center stall for my wife and Mike. Race day morning weather called for temperatures in the low 30s getting up to the low 40s. It was every bit of the low 30s for sure when we set out. Mike met us at our house at 6:30am and we drove to the Pennsylvania side parking lots and took the 10-15 minute walk across the bridge over into Trenton, New Jersey. 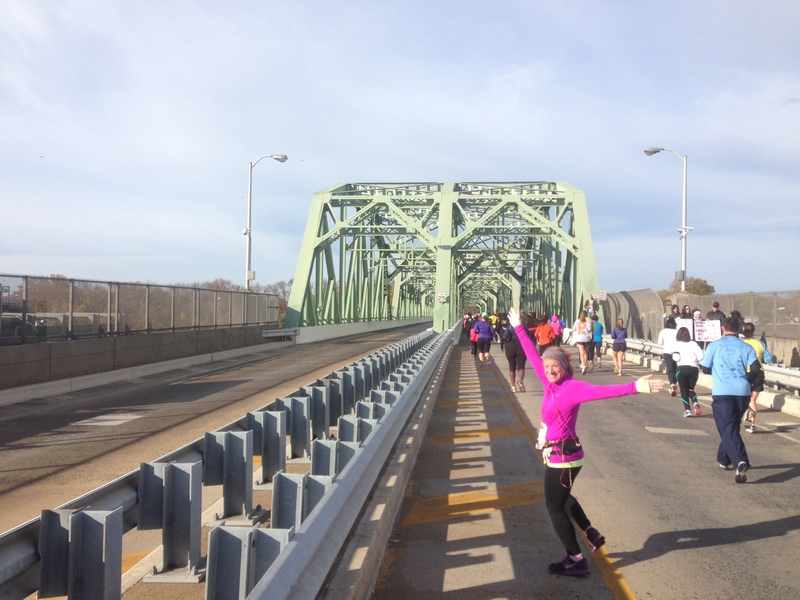 The race is called the ‘Double Cross’ as you cross the Delaware River twice during the run. 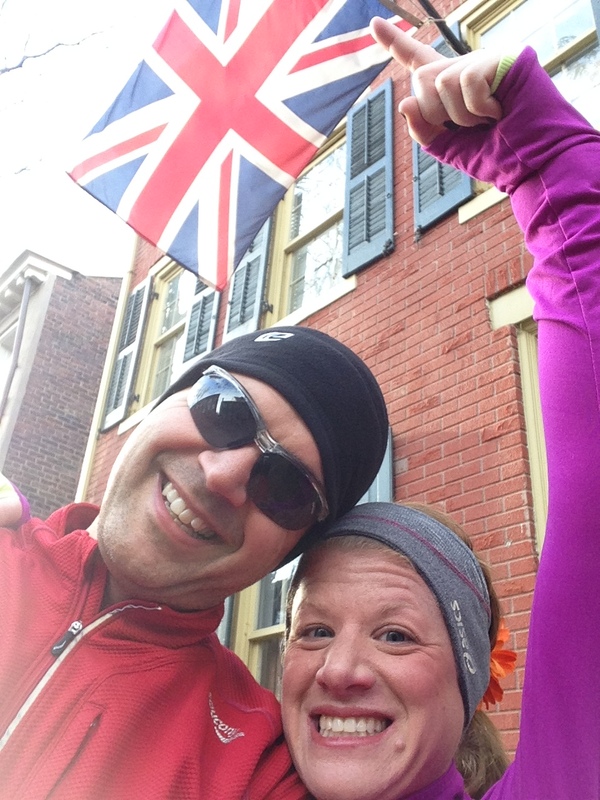 First from Trenton, NJ over to Morrisville, PA around mile 4 and then back later in the race around mile 6. The announcer did a great job of describing the sights we would see as we ran around the historic area. This is in the area where General George Washington crossed the Delaware River in December 1776 to defeat the Hessian forces in Trenton, NJ (this is a history lesson coming from a British expat with dual citizenship). There was a group of Revolutionary War re-enacters at the start line with pipes and drums too trying to get everyone into the spirit. After the National Anthem the gun (or probably a musket) went off and we set out on the road. It was strange running on these streets as these are the roads that I travel to and from work everyday and I never really get to see them at this pace (or from the outside of a car) and it was nice to look around a bit more at the surrounding areas. 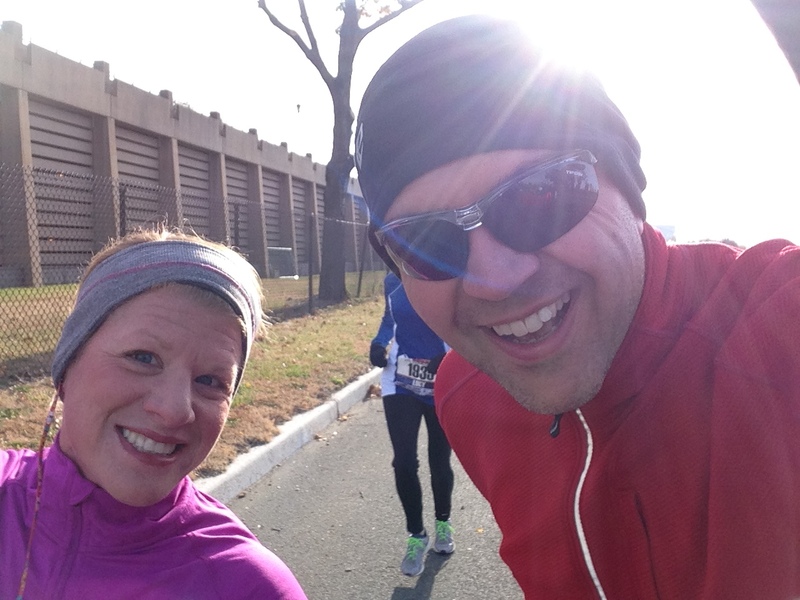 My wife and I set off at a planned pace of 10 minute miles using Galloway walk breaks with intervals set at 4:00/0:40. This was to be practice for the marathon next week. We ran together at the Philadelphia Rock and Roll Half in September and paced around 9:10 per mile but today as said earlier the plan was to ‘do no harm’ before next week. A running selfie in the first couple of miles. 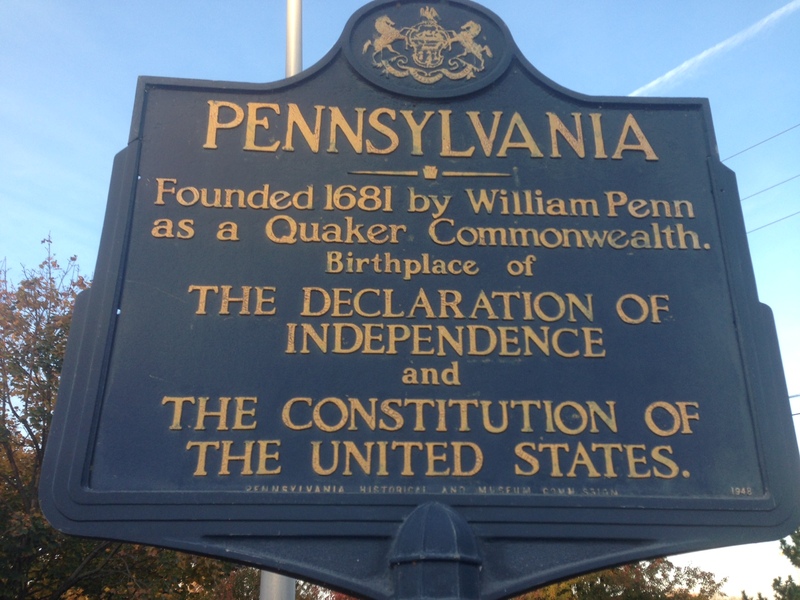 The route took us through some of the historic sites around Trenton and past the State Capital building, Thomas Edison College and some of the surrounding neighborhoods before heading us out and across the historic ‘Trenton Makes, The World Takes’ bridge across into Pennsylvania. 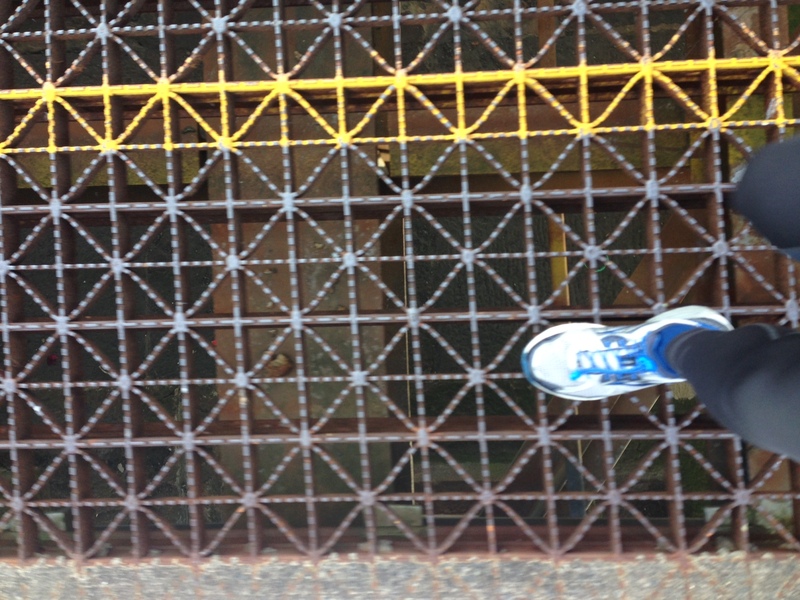 As we ran across the bridge we noticed that it wasn’t paved and that it was a metal grid which you could see directly straight down. Two things crossed my mind…(1) don’t look down and (2) thank goodness I’m not on the barefoot/minimalist shoe bandwagon. Ouch. The bridges were not very long and once we crossed into PA we took a small route along the river (past the parking lot with my car) and up just beyond the Delaware Canal (at which point we were able to recognize where we were in relation to where we usually train) and then down alongside the river up to the second bridge. This was probably the most crowded part of the race as we were merged with the 10K runners for this period. Once we crossed the second bridge (my wife and I snuck onto the sidewalk at the edge of the bridge (which was just a wooden boardwalk and still not paved) we split again from the 10K runners as we reached mile 7. Speaking of mile markers they were all a little off. Don’t get me wrong, the race was indeed a half marathon (my Garmin said 13.16 which was close enough) but the mile markers seemed off. Myself and many people around me had their watches beeping at a mile distance about 0.1 miles before we reached the mile markers. This happened consistently through mile 8 when suddenly we were ahead of the mile marker at mile 9 then behind the mile marker at mile 10 again. It didn’t make much difference to my wife and I running with our Garmins but I’m sure if you were to run with just a stop watch your head must have been going crazy as your splits would have been all over the place. Between miles 7 and 9 there was a pretty big hill as we ran a loop around Cadwalader Park. It was a nice run. The surrounding neighbourhood had lots of old historic houses and I have to say I really enjoyed the scenery throughout. 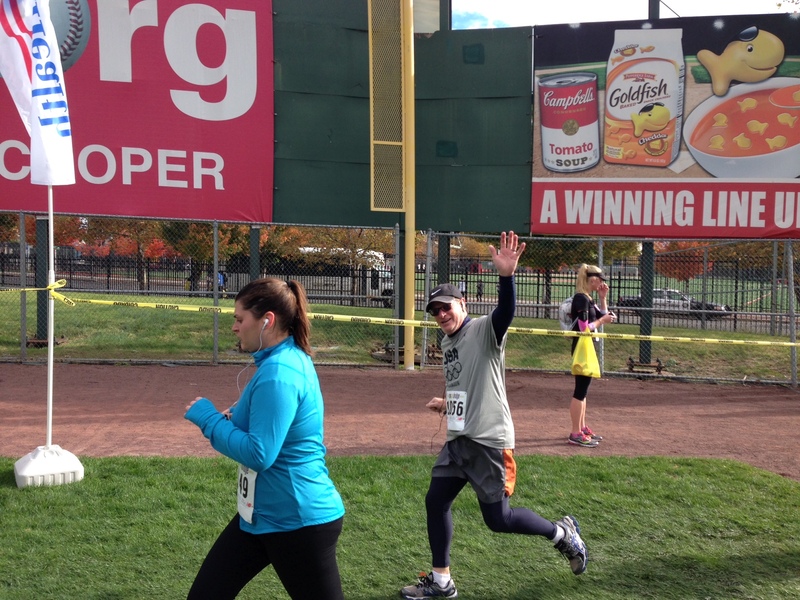 As we turning out of the park we were getting close to the last 5K of the race which had us run up Route 29 and up into Arm & Hammer Park home of the Trenton Thunder baseball team. 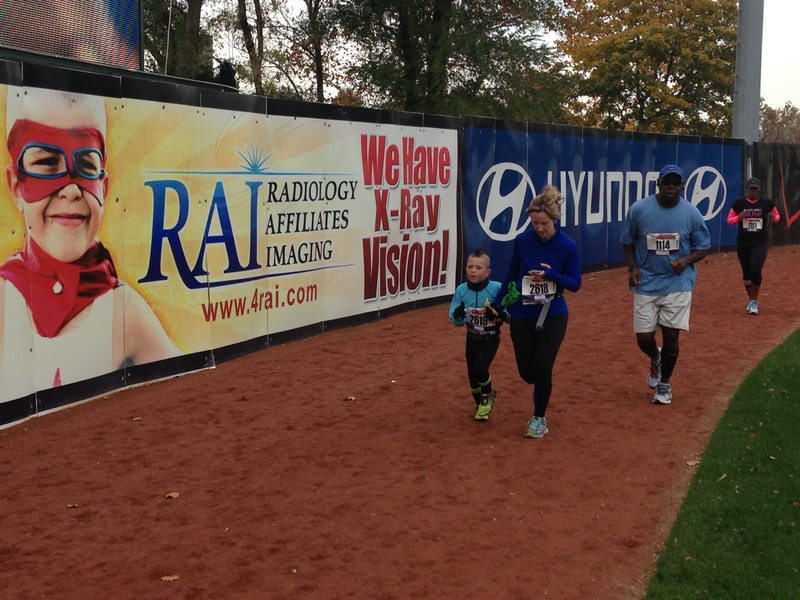 We entered the stadium in right field and ran the warm up track to cross the finish line in front of home plate. It was great that they had the announcer over the p.a. system announcing everyone crossing and even had the stadium big screen showing the runners running in. It was very much like running through the stadium at the ESPN Wide World Of Sports during the Walt Disney World Marathon earlier this year with the only difference being a 50 degree difference in temperature and this being at mile 13 vs mile 19. 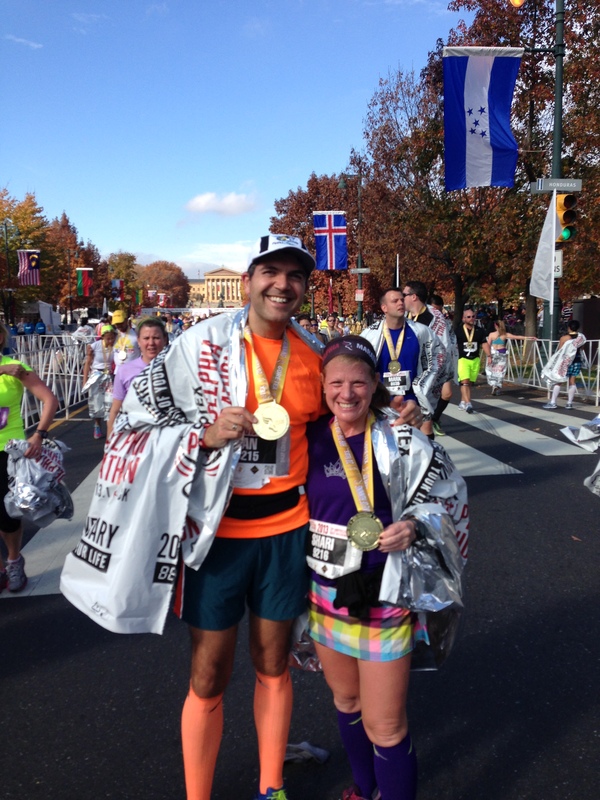 My wife and I crossed the finish line together in 2:06:59. 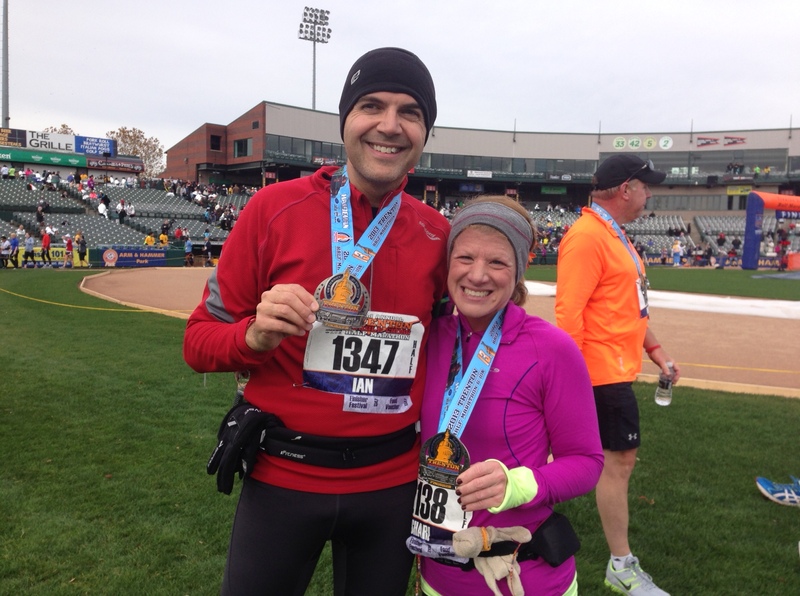 We actually ran under the 10 minute pace (around 9:40 minute pace) but both felt good coming through the finish. The medal itself was really nice. It was big, heavy and detailed. A nice touch for a race only in its second year. It was already a great day for us but we got to witness a couple more great things today also. 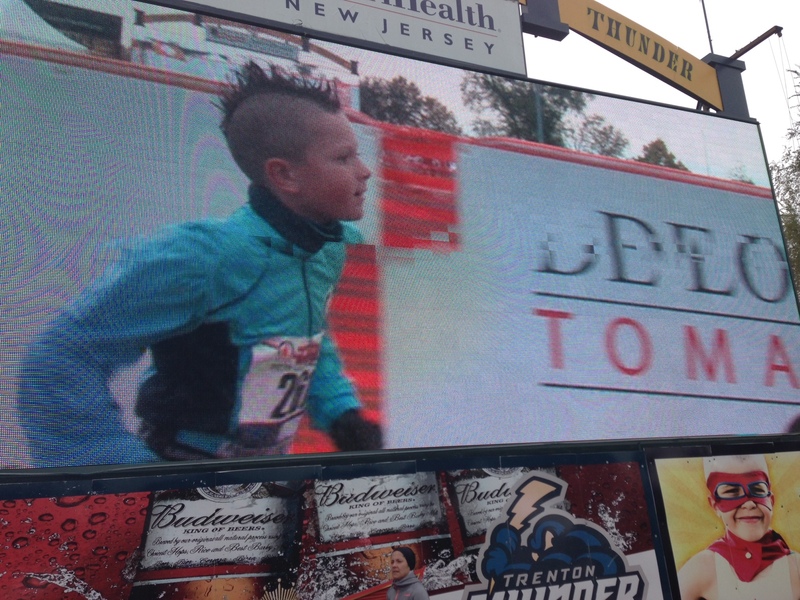 Firstly there was 5-year-old Anthony Russo who broke the world record for being the youngest person to run a half marathon. Wow. He ran alongside his mother for the race and sprinted the last 200 meters to the line to the roars of the crowd. 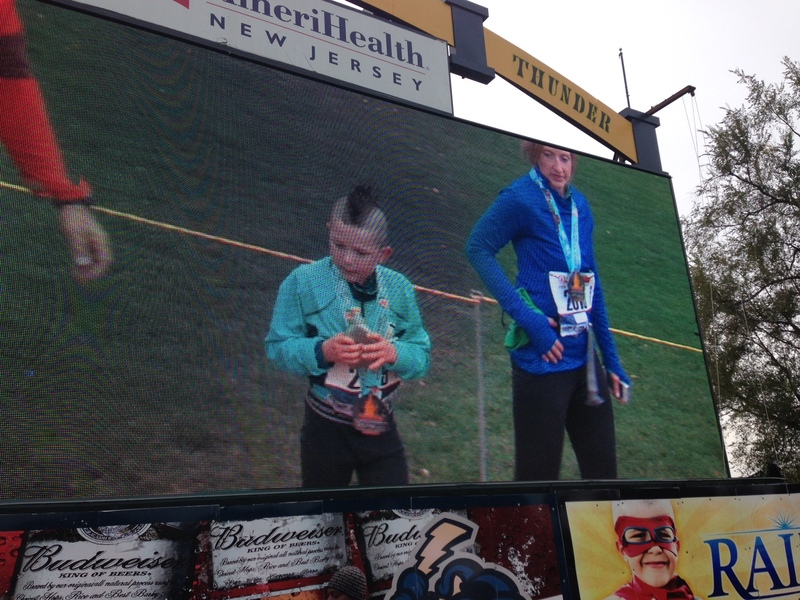 A 5 year old Half Marathoner. Impressive! The other wonderful thing to see was a friend of my wife, Abby, as one of two guides leading a blind runner to complete his first Half Marathon. Way to go Abby, it was inspiring watching you run in. Once we had seen all the excitement it was time to grab our stuff from bag check and make the trek back over the bridge (our 4th crossing at this stage) back to the PA side of the Delaware River to pick up the car and head home for a nice hot shower and lunch with the family. This was a great race which I would highly recommend to anyone. There are a couple of challenging hills at mile 4 and mile 7 but the rest of the course is relatively flat and there is plenty to see on the course. This may be one I return to next year. 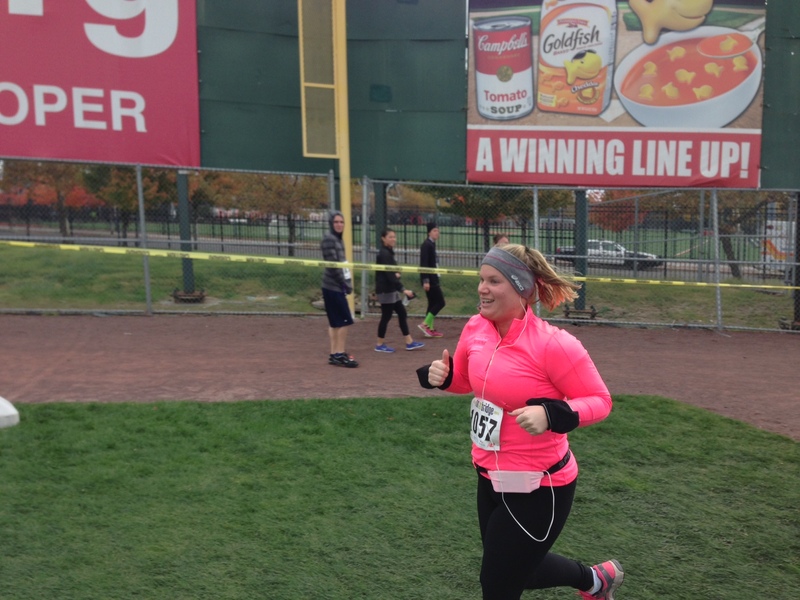 Yesterday I took part in the ‘2013 Cooper Norcross Run The Bridge 10K’ race. 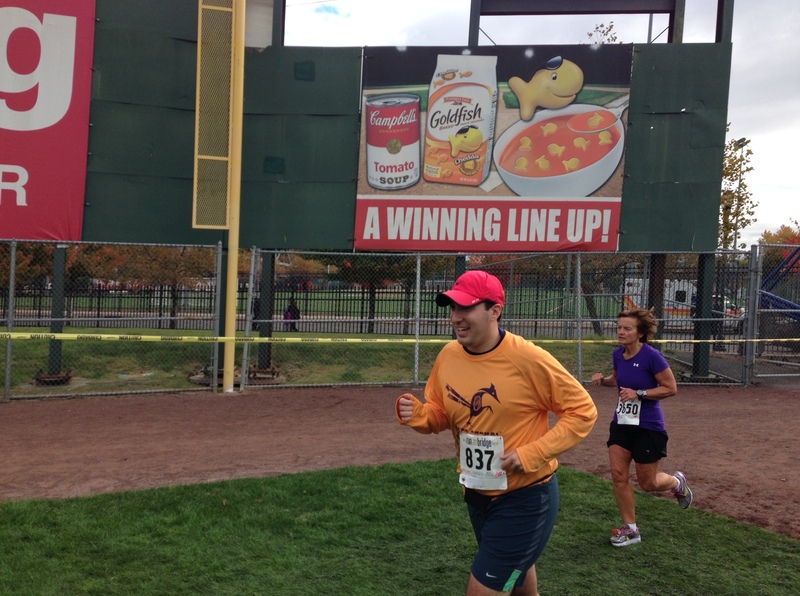 This is a race across the Benjamin Franklin Bridge spanning the Delaware River between New Jersey and Pennsylvania and then through the streets of Camden, New Jersey and along the waterfront before finishing in Campbell’s Field home of the Camden River Sharks baseball team. This was the first time I have run this race although my wife has run this the last two years and my father-in-law has also run this event a few times. This was also a 10K race and I do not seem to run many of these. 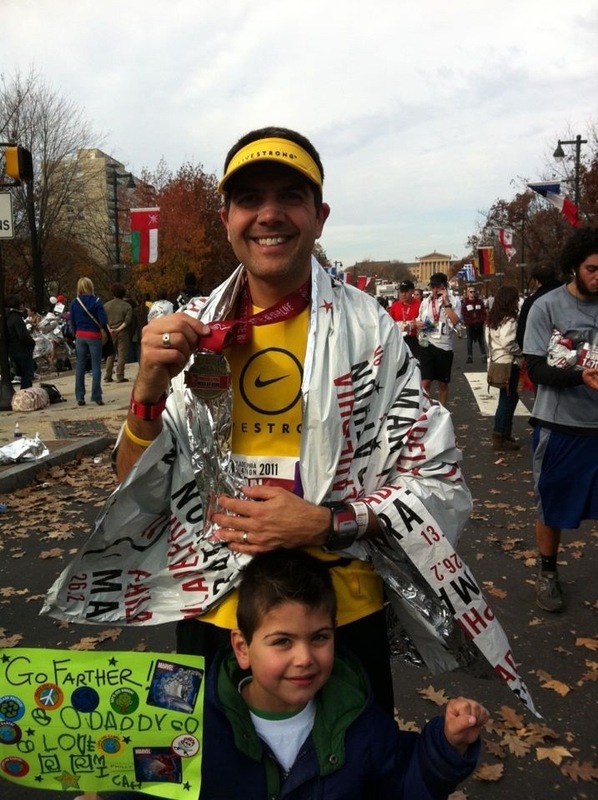 My PR for a 10K was set back in August 2011 of 52:07 at the Philadelphia LiveStrong Challenge. I hadn’t run a 10K race since then. I had it in the back of my mind that I was going to see how I felt given that I was 16 weeks into marathon training and if I felt okay I was going to go for a new PR. I wanted to see what I had in my legs going into the marathon and still I had a couple of weeks left for recovery and rest (the dreaded taper) before race day of the marathon. We set our clocks back on Saturday night which provided an extra hour of sleep (not that I really took advantage of it) and the plan was to meet up with my father-in-law, my sister-in-law and her new fiance (see what I did there Mike?) at a central meeting point and drive down to the starting line together at the baseball stadium to pick up our race numbers and packets. Needless to say not all of us set our clocks to the correct time (not mentioning anyone in particular) but the good news is that we were all together before the race with our numbers on and ready to go. 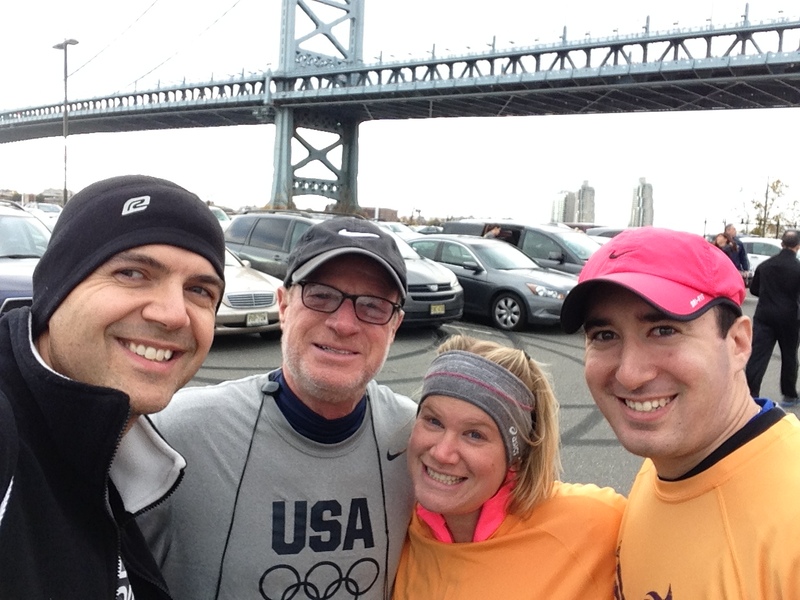 All of us pre-race with the Benjamin Franklin Bridge as our backdrop. I had done a 10 mile training run early on Friday morning and the weather was great. I was running in a t-shirt and shorts. What a difference a couple of days make. I woke up to find it was about 40 degrees and the wind made it feel about 10 degrees less. I dressed in my winter gear (tights, long sleeve shirt, gloves and a beanie). I wasn’t sure if I should wear an half zip over my t-shirt but I thought if I was pushing it I was better a little too cold than too hot as that would impact how I felt during the race. We wished each other luck and headed for the walk to the start line. I wanted to get a little ahead so I wouldn’t get stuck in the pack and everyone was fine with that (they probably prefered that but I’ll say it was to encourage me, right?). 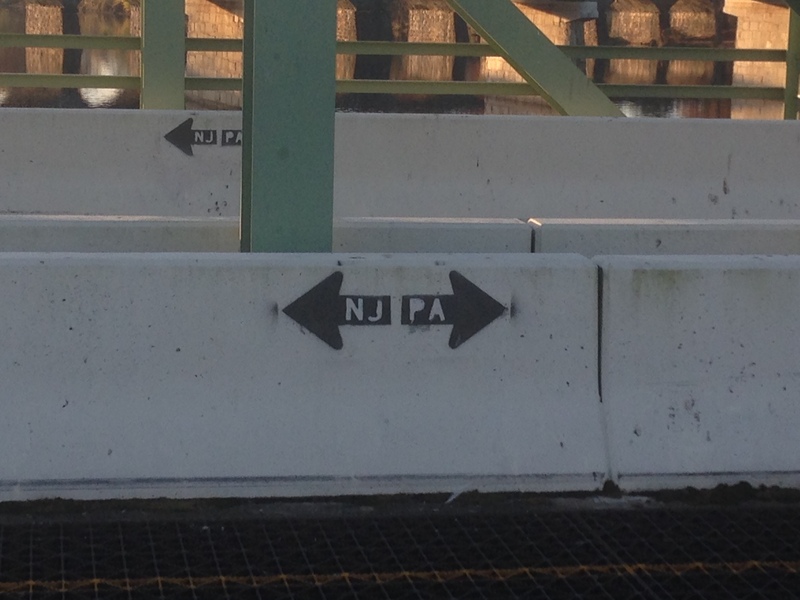 The start line is at the base of the bridge on the New Jersey side. It’s probably a half mile walk from the stadium up to the start line. I had not eaten before the race so I had a Gu (yummy Salted Caramel) with me and a bottle of water and headed out. I had turned my Garmin off when I was inside the stadium bathrooms as it had lost its signal and when I went to turn it back on it crashed. I rebooted it twice on the walk up to the start line. No good. Uh oh. I had also forgotten to stretch while I was getting my gear together and checking my bag. As I still had a few minutes I pulled over to the side of the road, rebooted my watch a third time and did my stretches. Third time was the charm with the Garmin. Well, almost. It had reset itself completely. I quickly set the watch up from scratch and changed the display to what I needed for the race (Distance/Time/Average Pace) and headed to the start. Once at the start line you actually had to jump a barrier to cross to the start line. I did that very carefully. Wearing an extra layer at the start line waiting for signal to go. The run up the bridge was pretty crowded as expected. It took almost the first mile to really start spreading the crowd out so there was quite of bit of weaving for me at the begining. I know it’s a bad habit of mine but I wasn’t as far up as I really needed to be among the pack of runners. Once I had reached the crest of the bridge for the first time I was able to let loose a little on the downhill section. I was wearing my Jeff Galloway Gymboss timer but I ignored the first couple of walk breaks as I wanted to get into position for the race and I felt okay. I was pushing hard but it was comfortable. The turnaorund is at the base of the bridge on the Philadelphia side and then you are faced with running back up the bridge again. Honestly I just put my head down and didn’t think about the incline. I was running comfortable and it didn’t seem to bother me. There was a water stop on the way back across the bridge so I took my first walk break which was a little out of sequence but I took it for the full 40 seconds and then headed up the bridge and down into Camden. Once across the bridge the race seemed to be pretty flat for a while. There were a couple of turns and I wasn’t sure when the next water stop would be so I took a walk break only to find the water stop around the corner. Ugh. Well, never mind, I can run and drink at the same time but I am useless at making the trash with an empty cup while running. 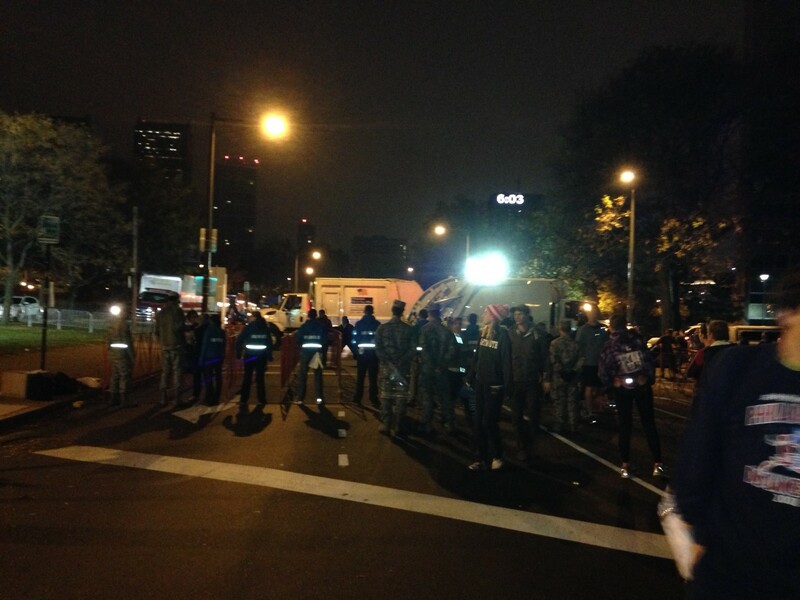 As we were now running on the city streets and were sheltered from the wind it started to feel warm. I was still wearing my beanie and gloves so I pushed my sleeves up a little and rolled the beanie up to let me ears out. 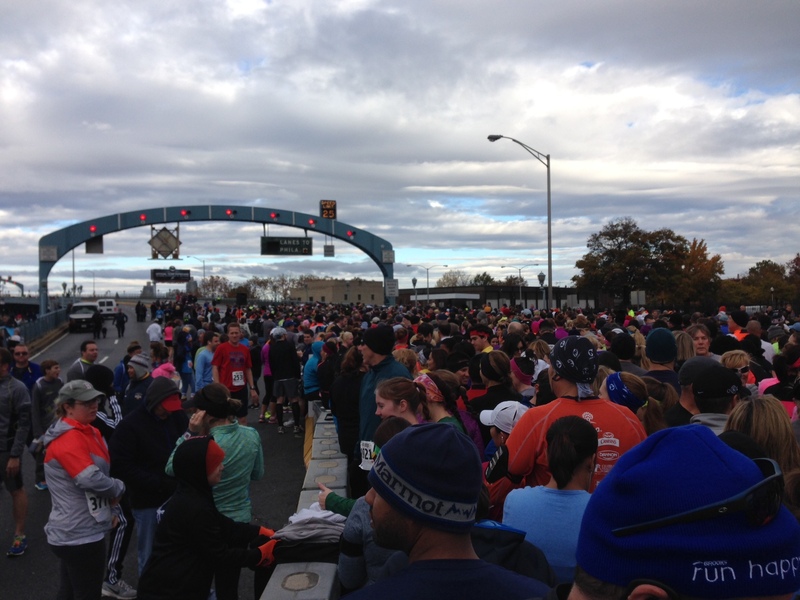 The race along the streets was fine and then we turned and headed towards the navy yards entering it through a back entrance. This took us up to the waterfront where we ran alongside the pier where the SS New Jersey now stands as a museum. At the waterfront the wind picked up and I’m glad I had my warm gear on. From there pier the race headed up a small incline and down back to the streets of Camden. My time was going well and I felt that it was going to be possible to run a new goal under 50 minutes. We turned to the left and I saw the stadium and was thrilled that I could see the finish line location up ahead and my time was great. What I hadn’t done was read the course map correctly. D’oh! We didn’t run directly back to the stadium but took a turn right and ran around some rehabed condos and approached the stadium from another angle. Was I going to make it in goal time? I entered the stadium into right field and the finish line was in left field. I dug deep and ran to the finish line. I hit my watch and it read 49:08:55 (49:09 was my official time). I felt great. I didn’t hurt and I made a goal that I set myself. 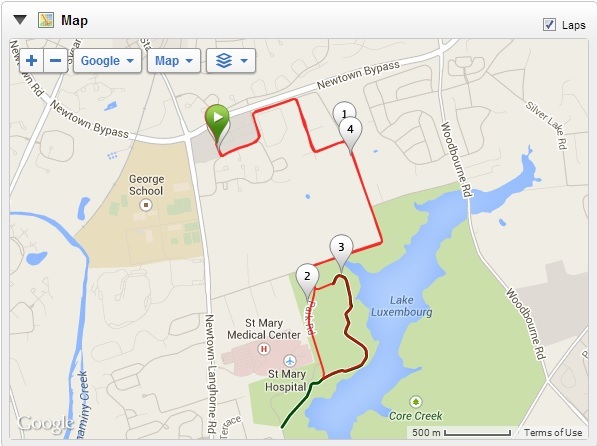 Here is my Garmin file with the map and my splits http://connect.garmin.com/activity/399334028. The event was run for the benefit of the Larc School. The students of the school were on hand to hand out the medals to the runners. From there I grabbed my water and goodie bag, picked up my checked bag, stretched and headed down to the finish line area to wait for everyone to finish. I grabbed a good spot and was able to cheer everyone on and get some great pictures of everyone coming down the chute to the finish line. 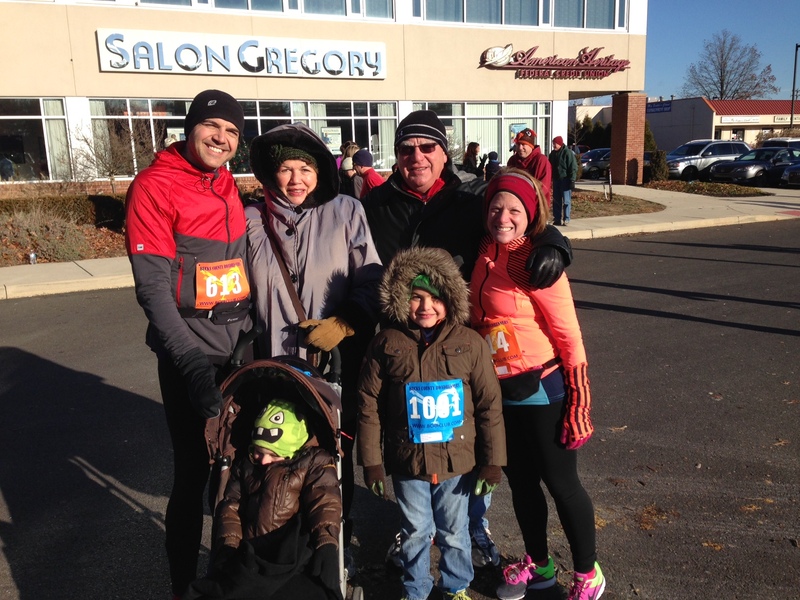 A big shout out to my father-in-law who was running a race after a lay off from running for about a year. He looked good and said he felt good after the race so I’m pretty happy about that as is he. Mike and Rina ran into the stadium with smiles on their faces (I think they knew I was taking pictures) but as far as I know they had fun. 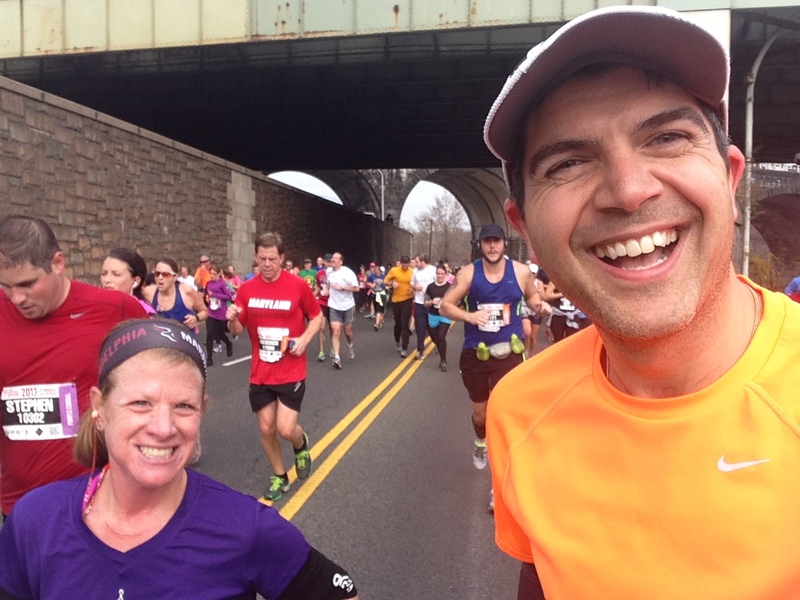 Mike is running with my wife and I in next week’s Trenton Half Marathon so I am looking forward to running alongside him for the first time then. I like racing with family and friends. It is rare that I really go all out for a PR but as I made my goal today I felt justified for being solo. There will be many races I run to be with others but there are the occassional challenges I set myself. Today was one of those days and it felt great. The race itself was fun. There was no expo for this race. Packet pickup was from a local running store in South Jersey but seeing as none of us were able to get there we did race day pickiup (as it seems most people did). There was also a walk and a Kids race but as I was running I didn’t get to see how these went. Everyone seemed to have fun and the ability to park in the stadium parking lots, walk up and get your number on the day and check a bag was really convenient. I’d recommend this race for anyone looking for a fun 10K.